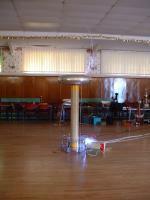 Derek Woodroffe's Sprite, As usual I forgot to take pictures of my own stuff! 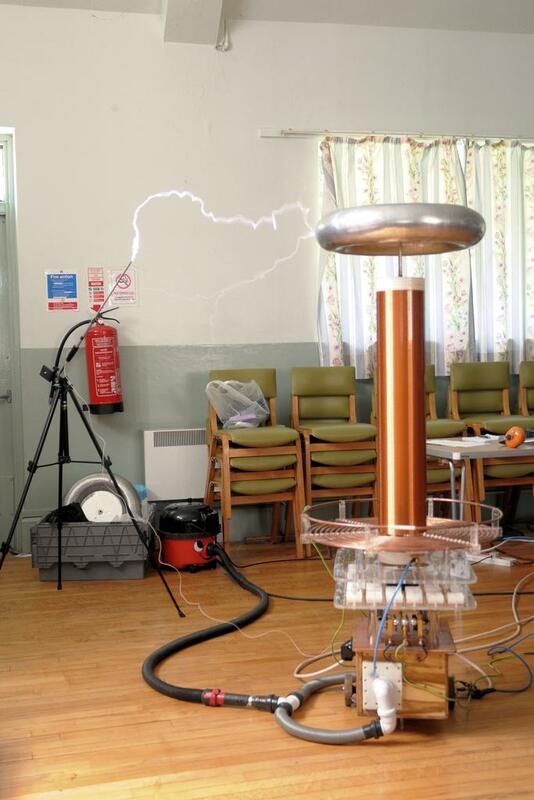 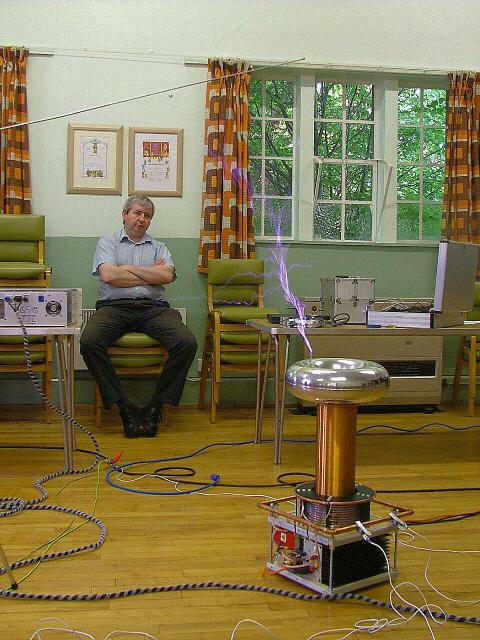 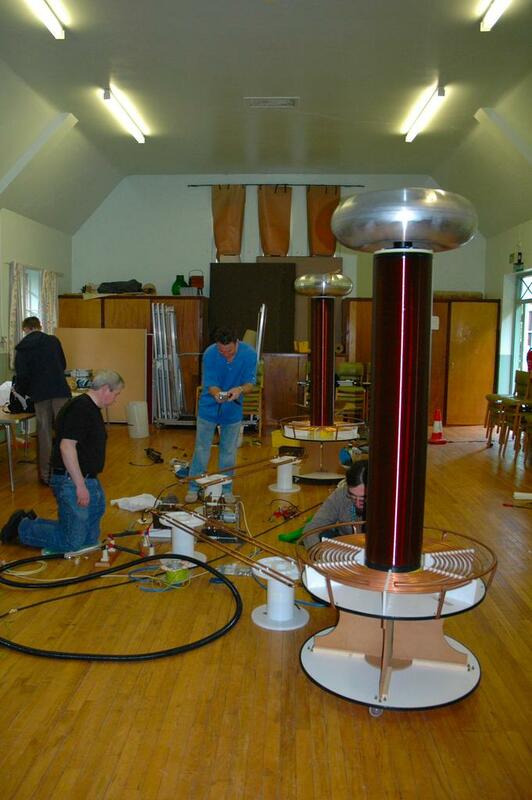 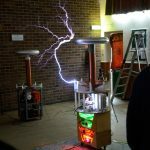 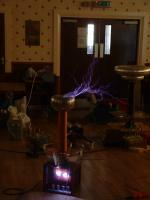 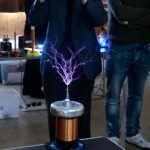 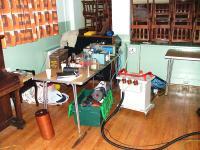 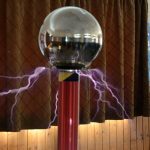 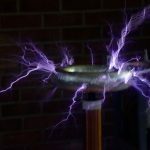 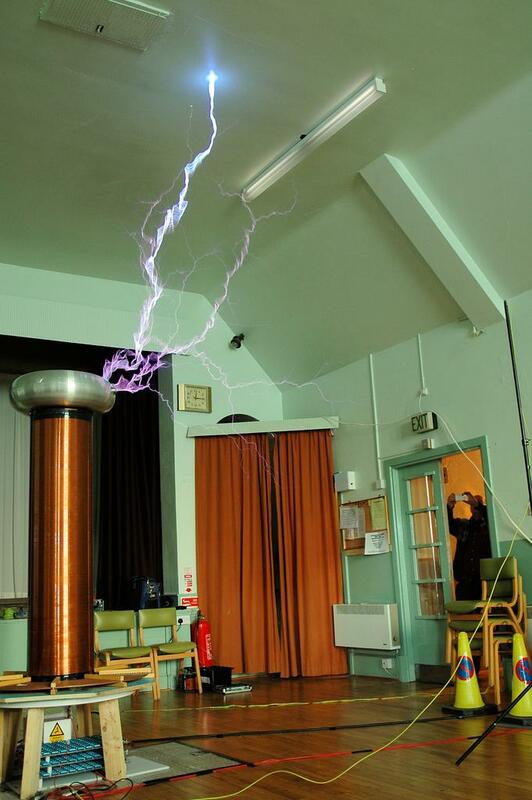 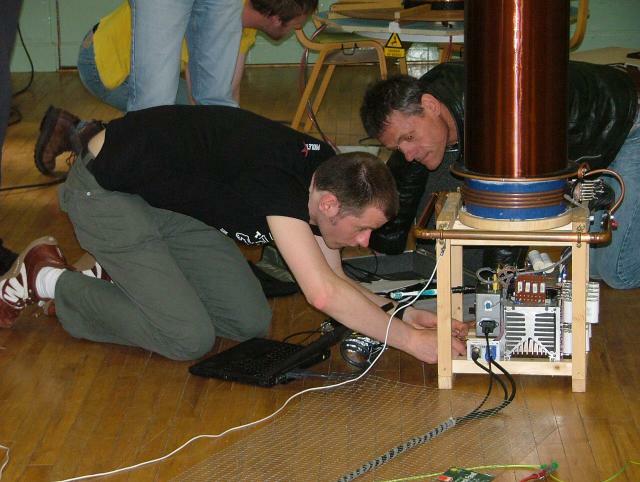 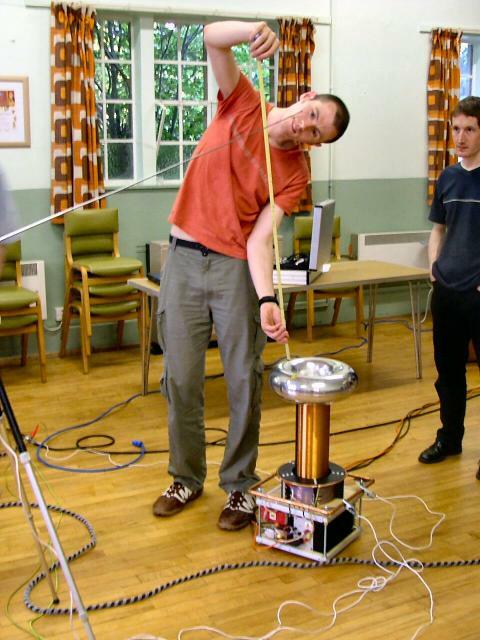 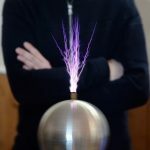 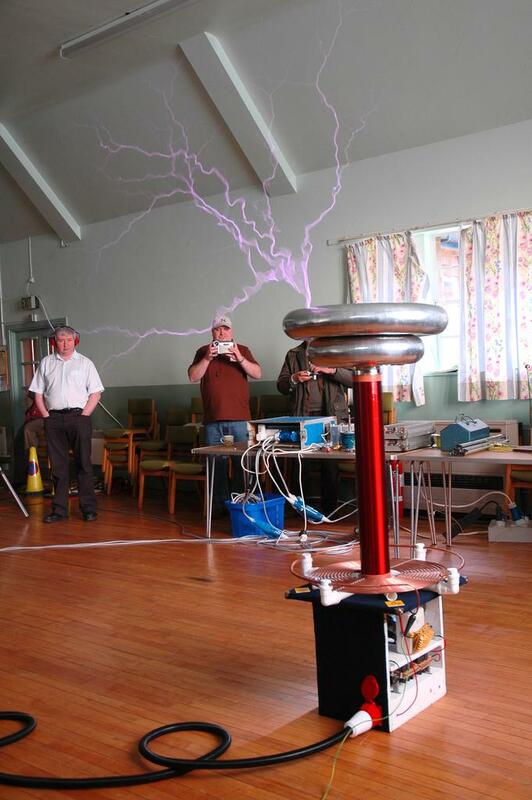 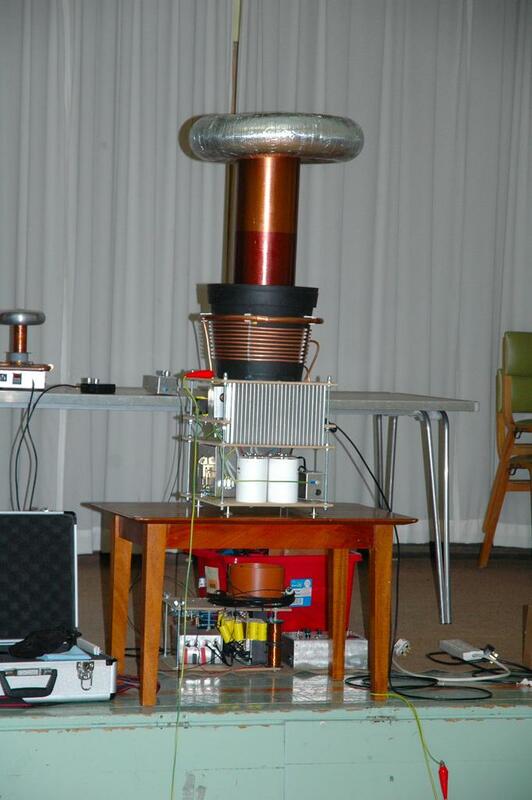 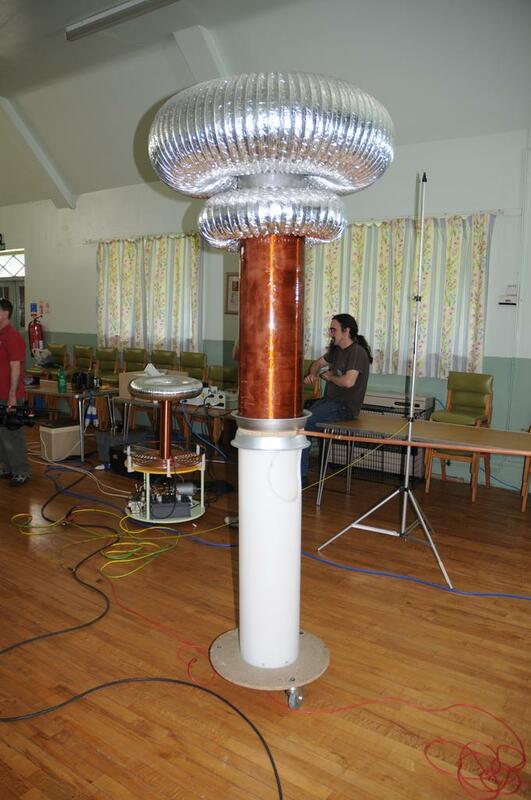 Static Gap Tesla Coil - Owner ? 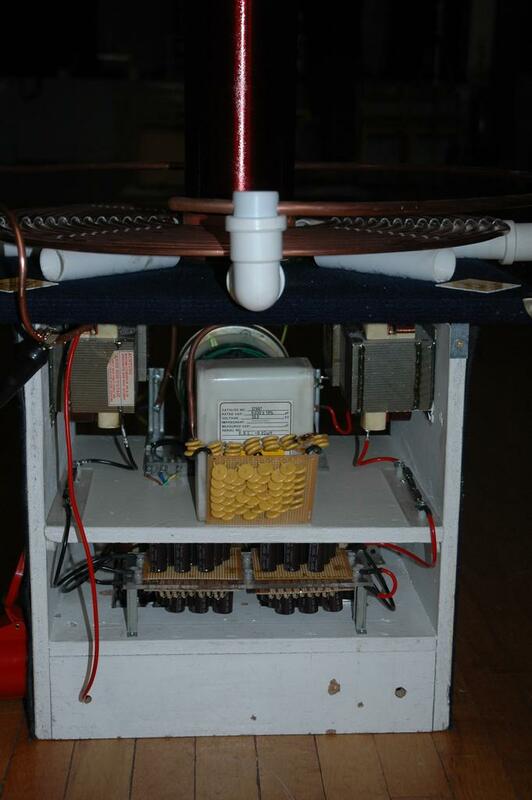 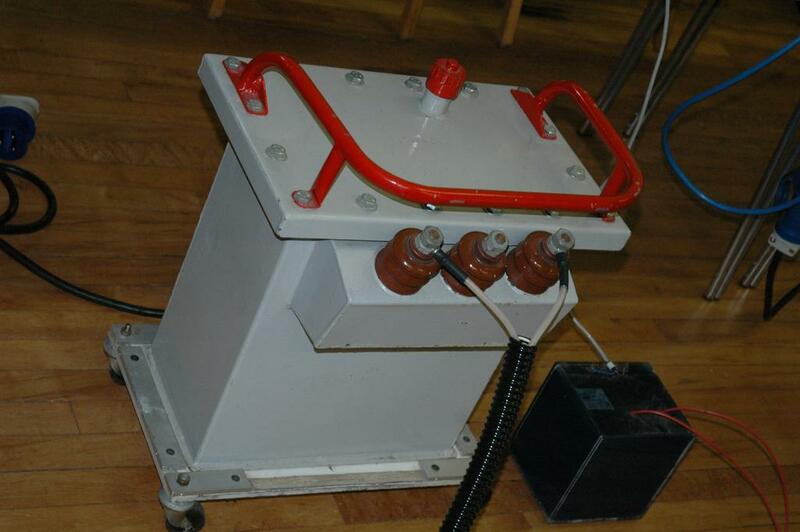 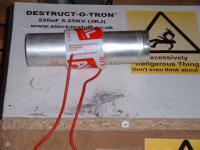 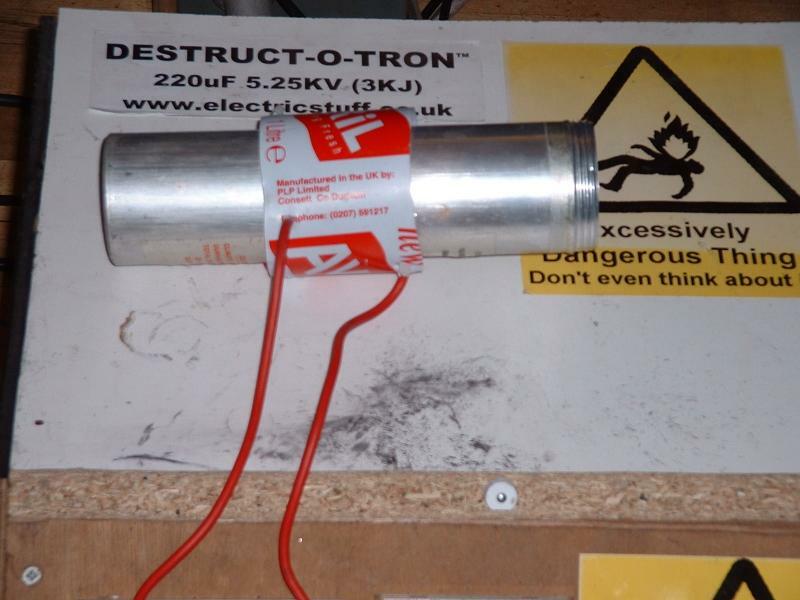 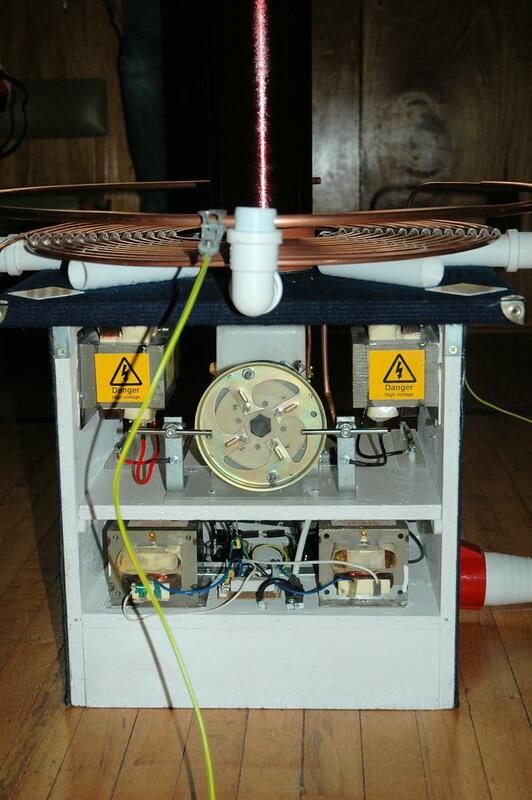 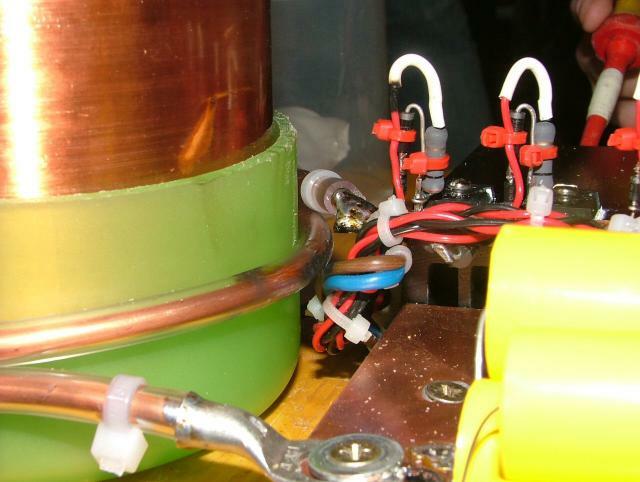 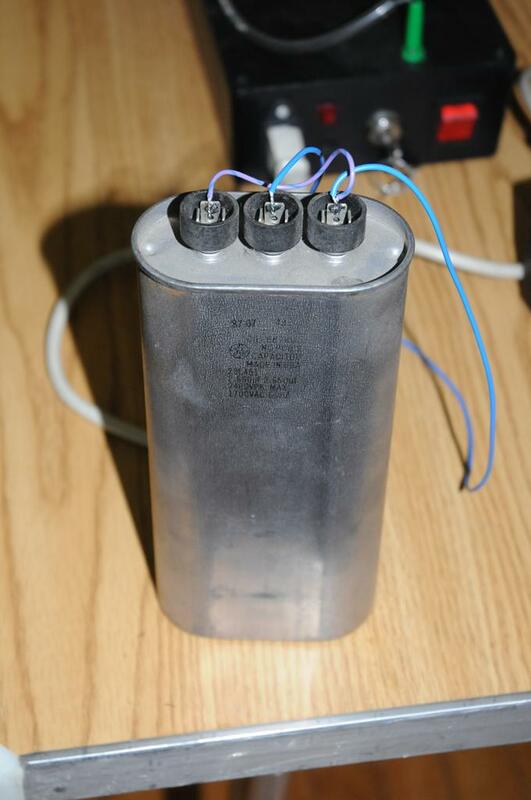 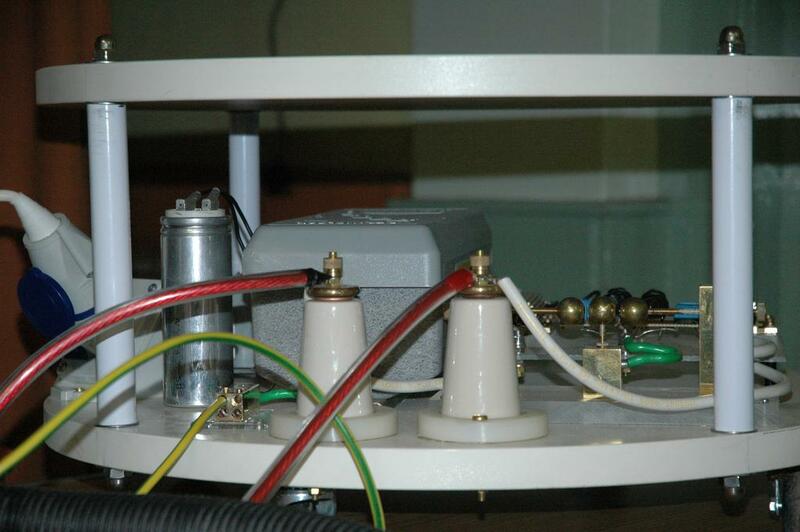 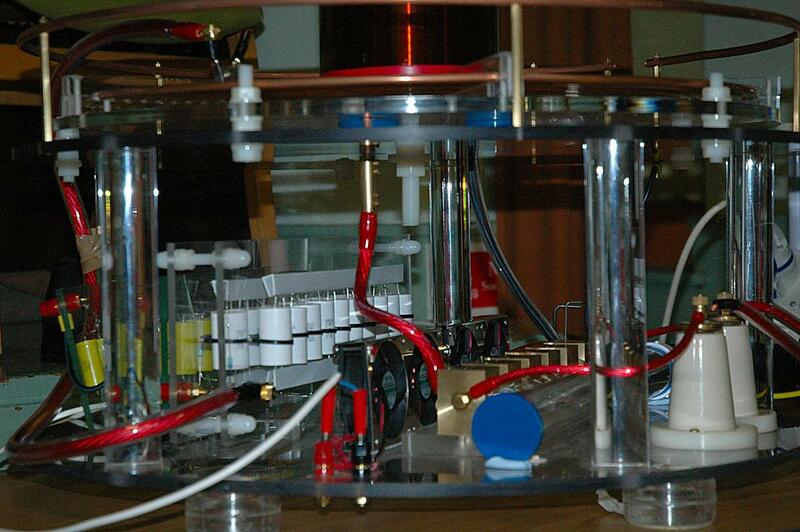 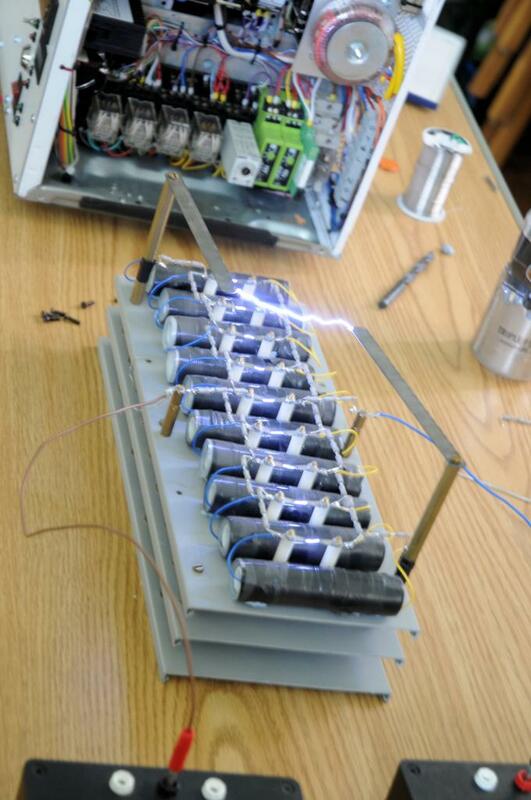 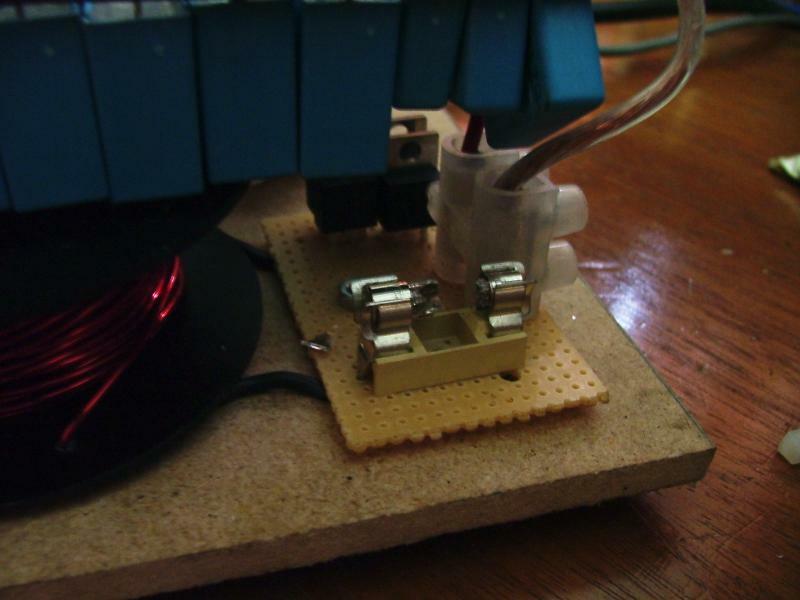 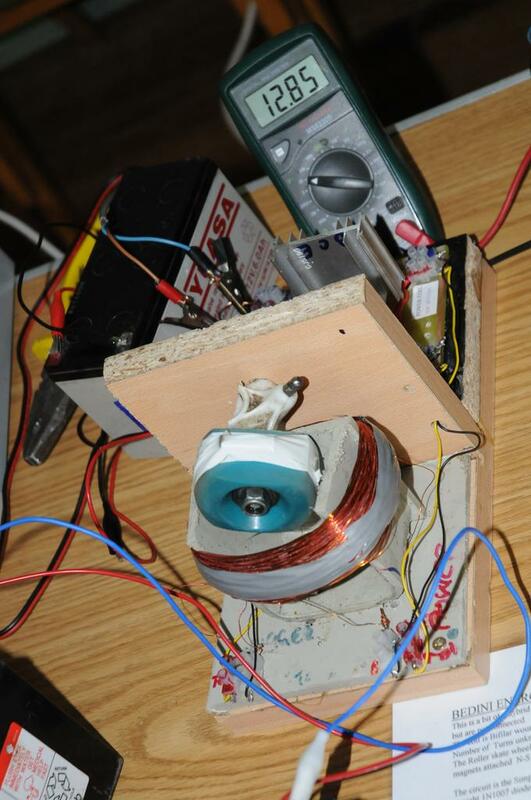 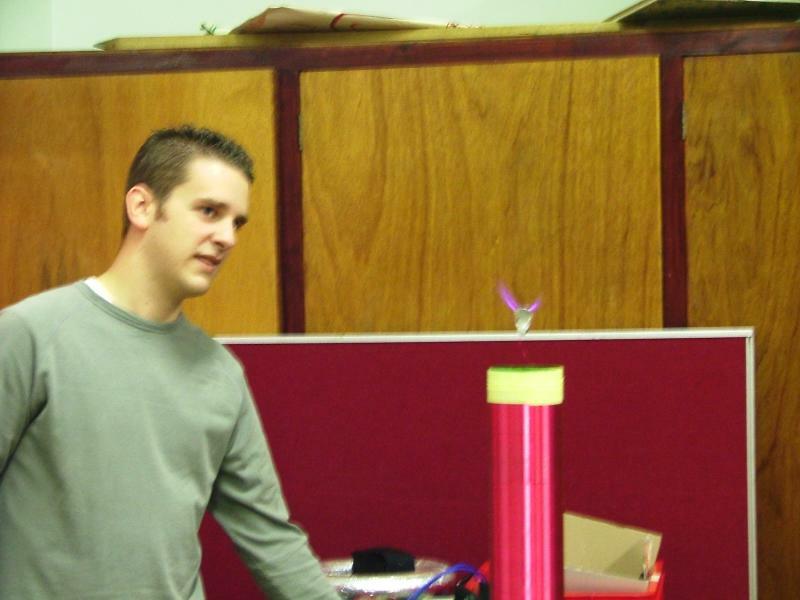 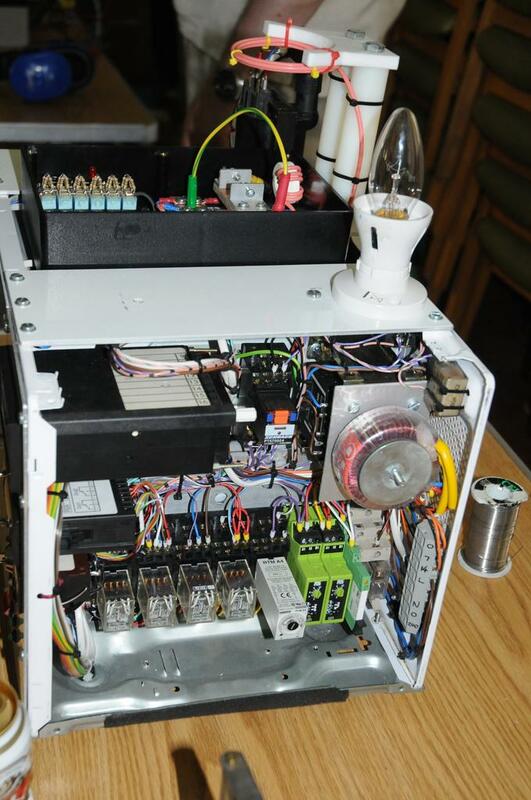 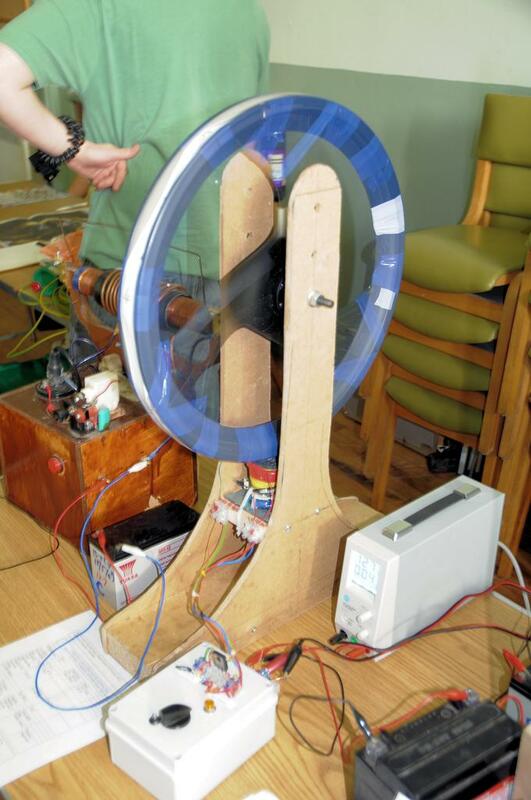 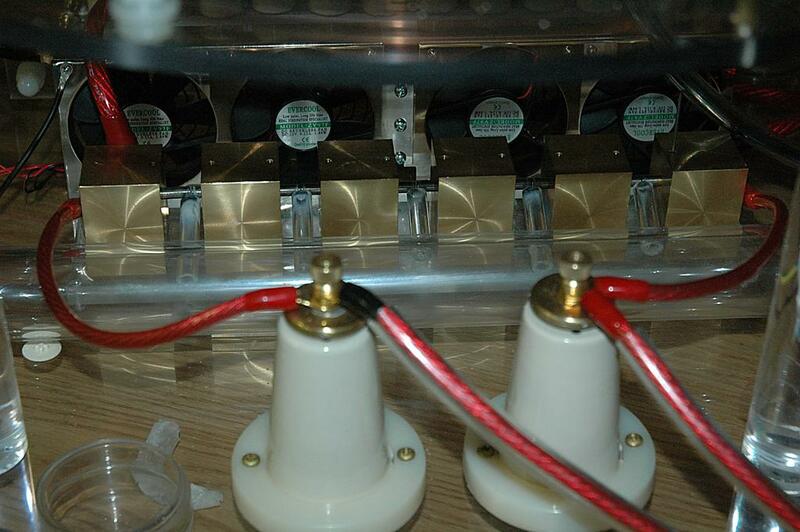 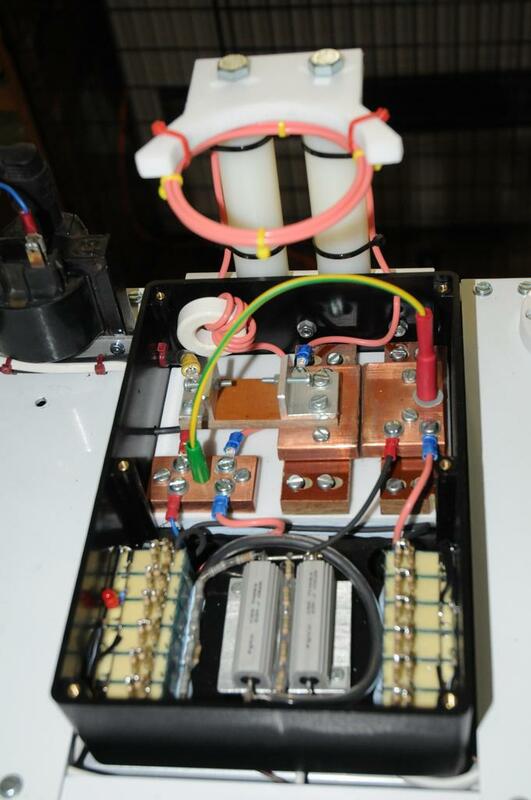 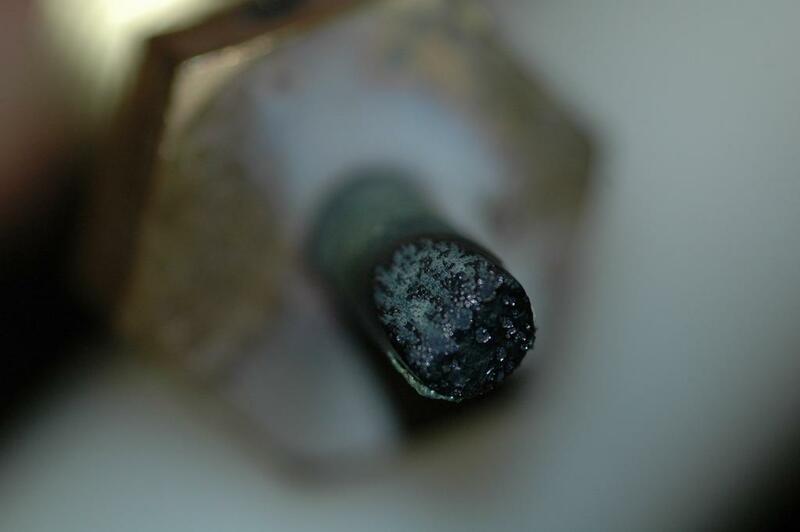 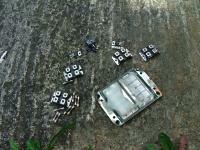 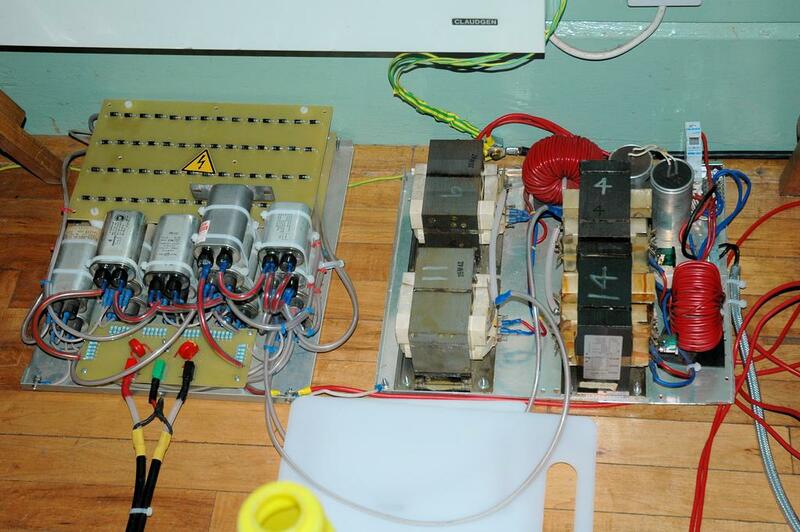 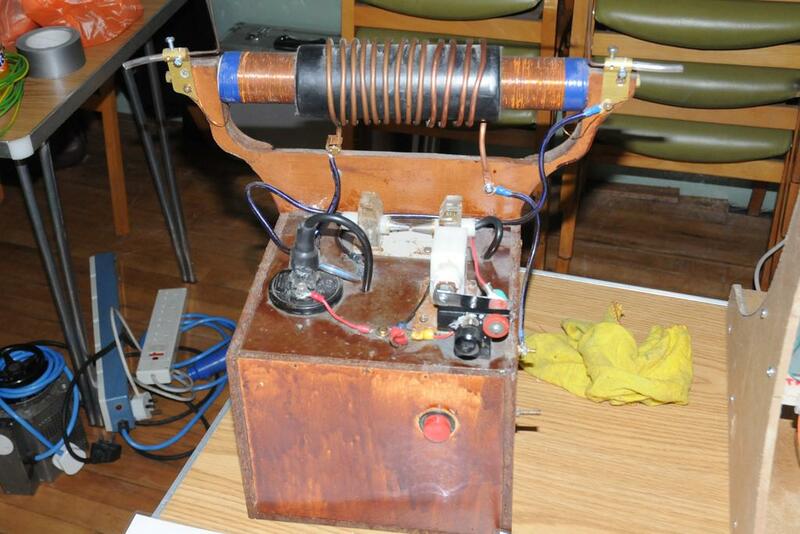 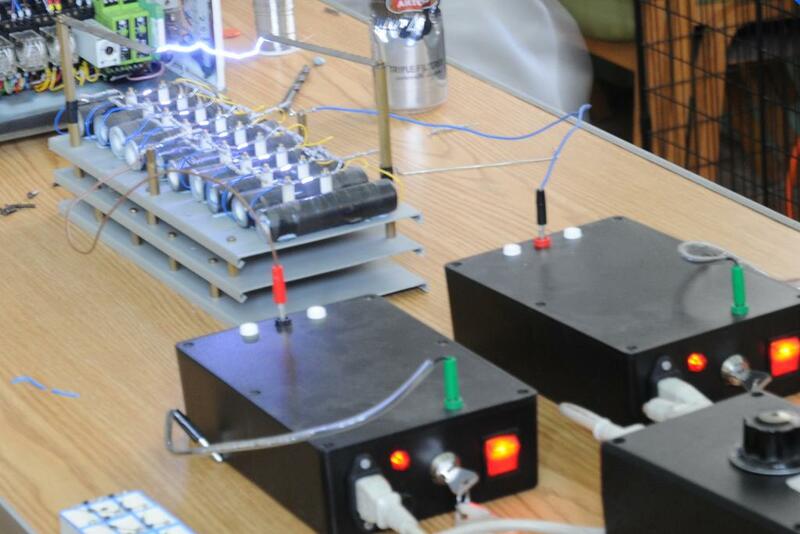 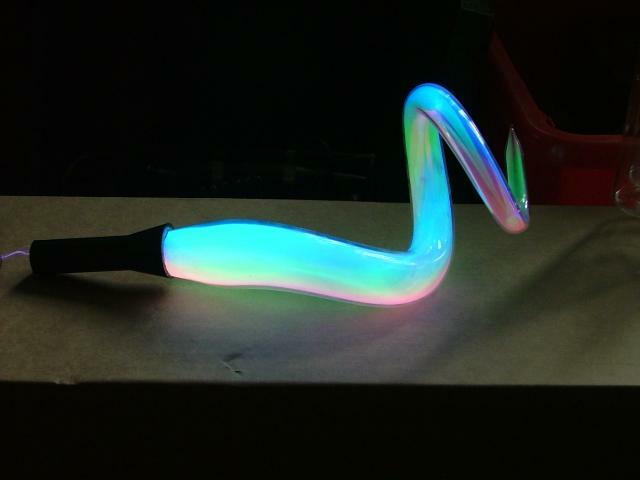 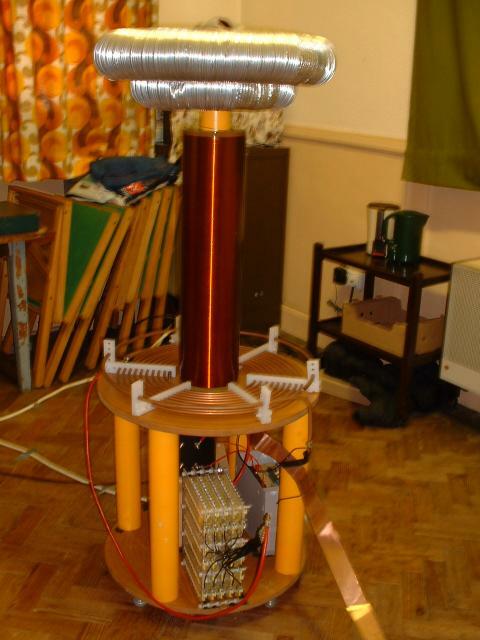 If anyone has any picturs of my (Derek Woodroffe's) coils from this thon please can you email me a copy to tesla(AT)extremeelectronics.co.uk. 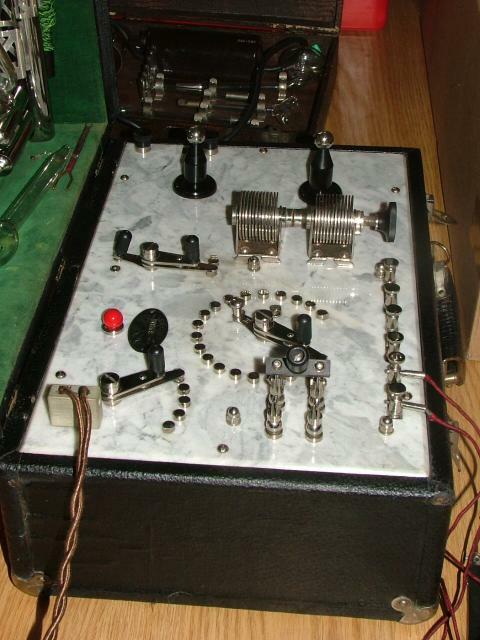 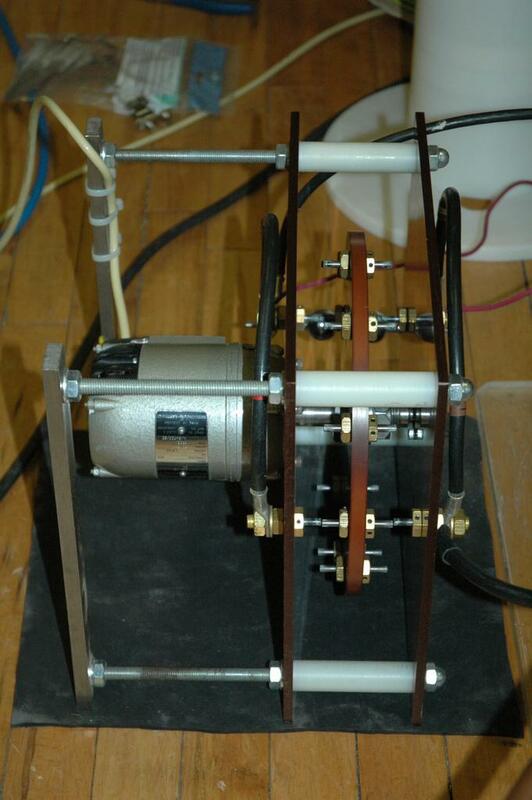 An Old Diathermy machine Im sure this would not be good for you !! 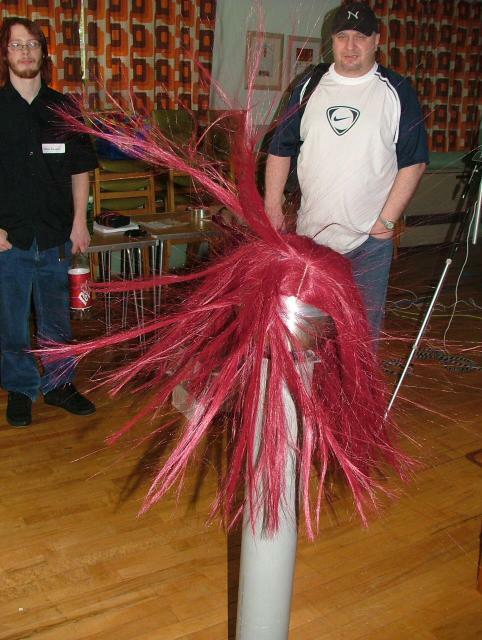 A Visitor plays with Ikle Tess My CW Multiplier has a hair raising experiance. 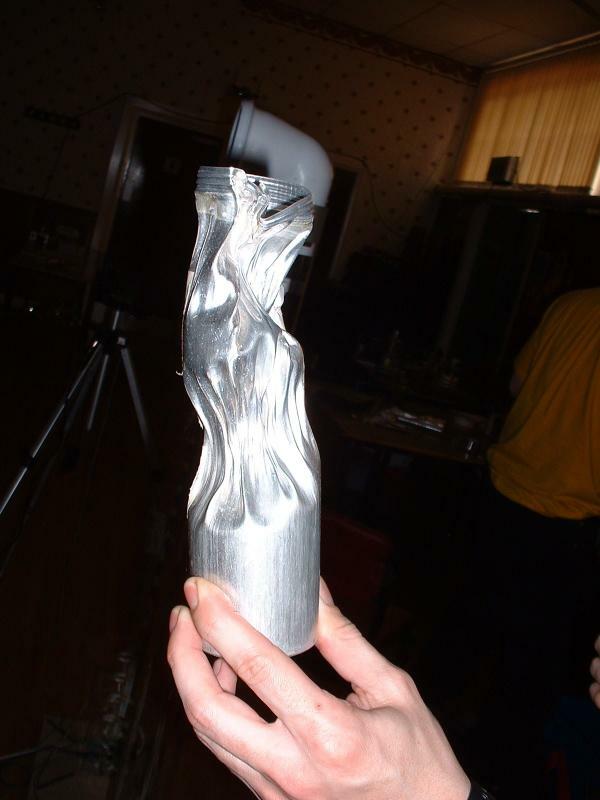 Mark Hales Brought some interesting glassware. Colin Heath's SSTC arcs to earth. 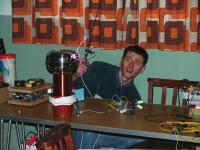 My OLTC in TT (Twinkle Twinkle) mode. 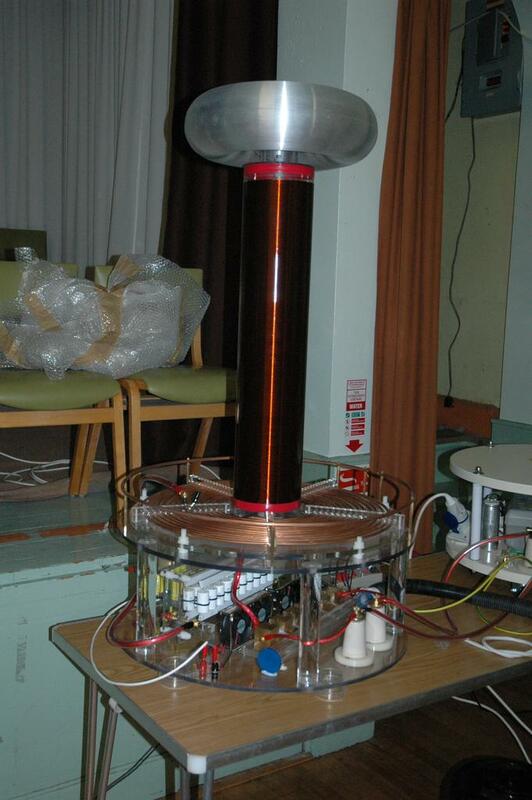 Finn's very nicely built OLTC primary. 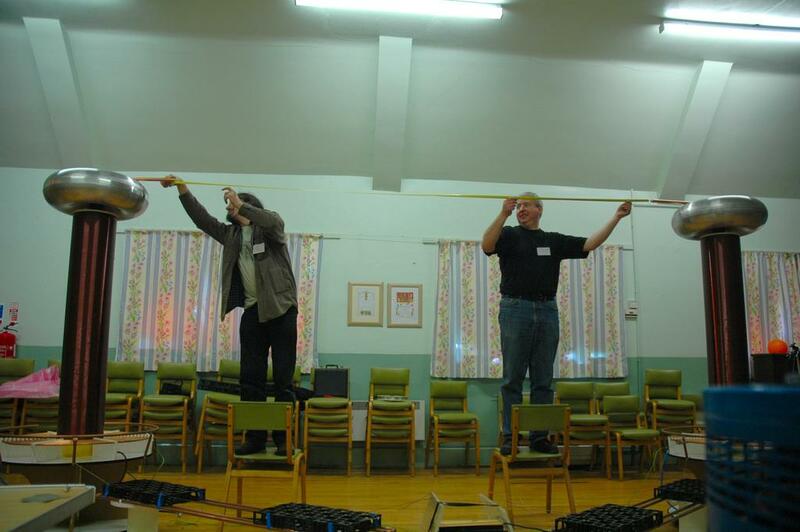 Martin Dale get a 6'7" Strike to earth. 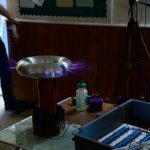 Video of Martins coil in action. 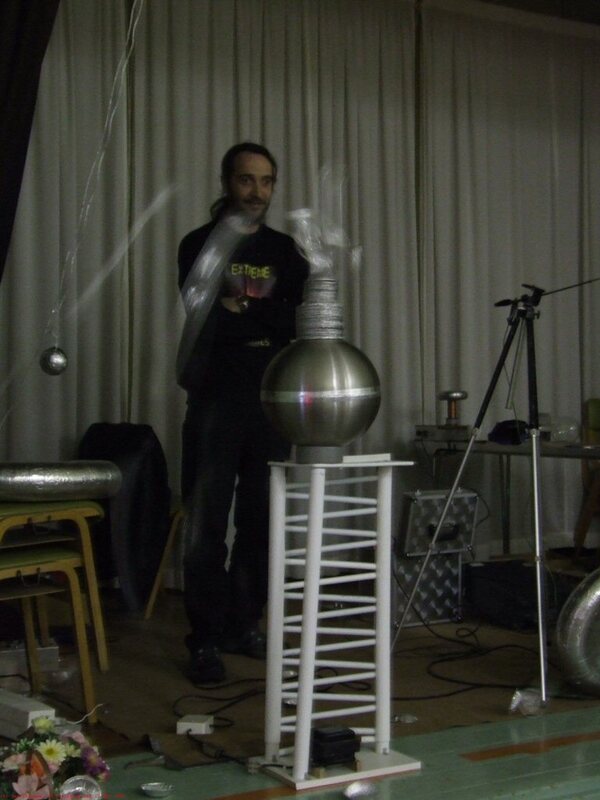 Video of OLTCII acheiving 6',1"
Steve's OLTCII arcs to earth, blowing a 240v 30W bulb. 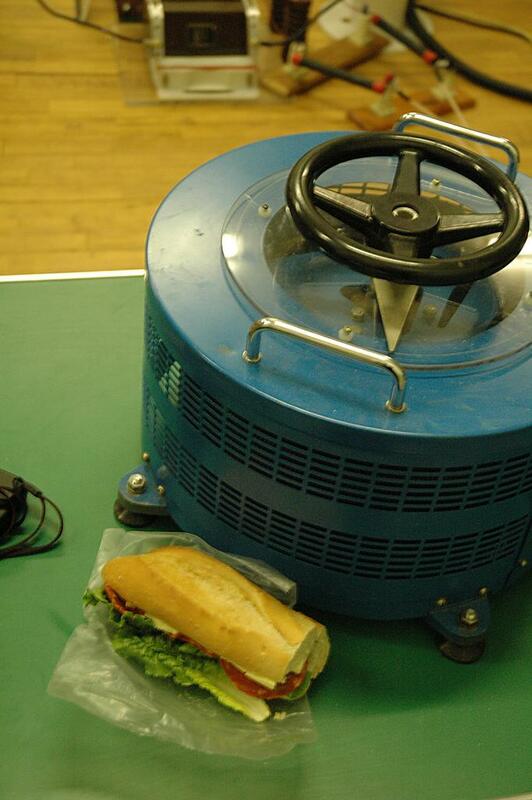 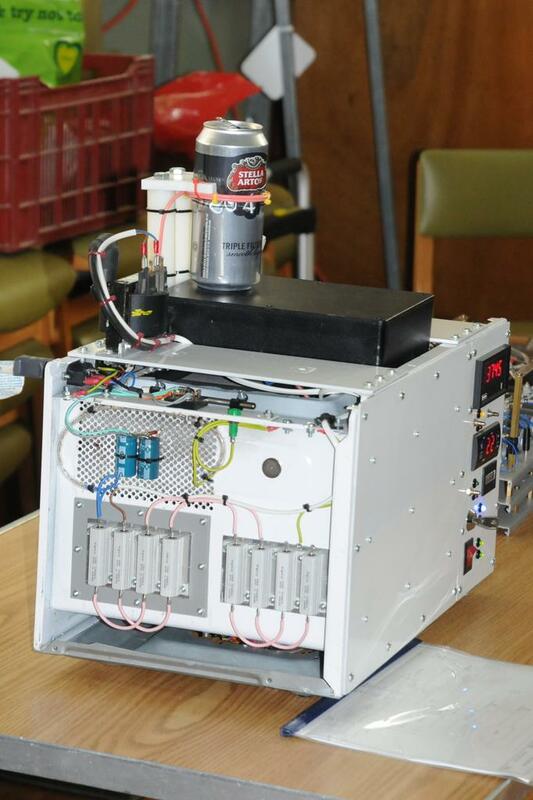 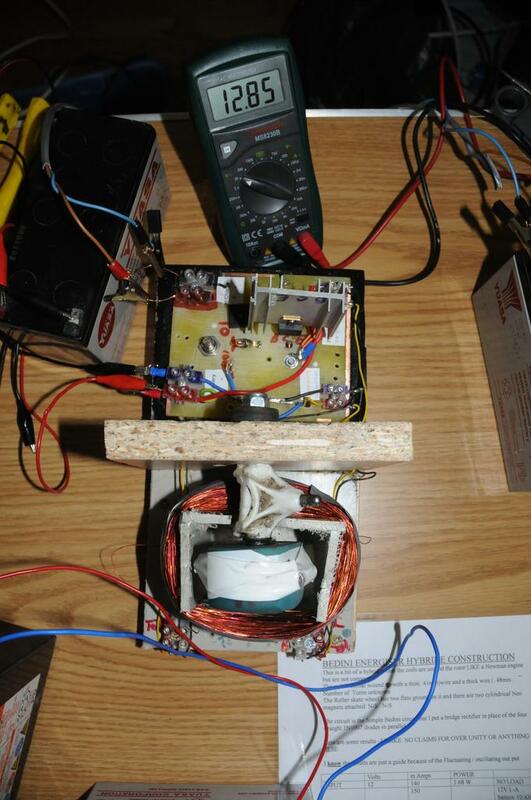 Phil Parrys VTTC Running, No Smoke!! 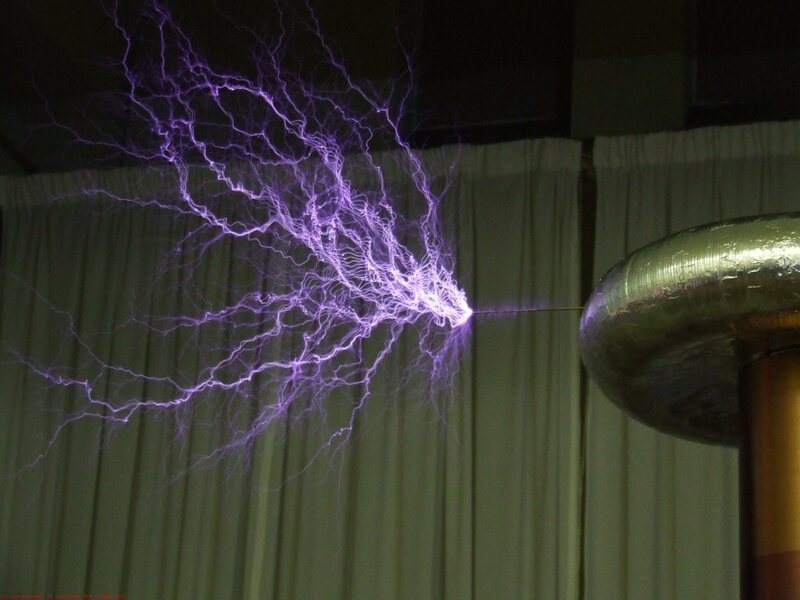 for the day. The collective silicon cemetery for the day. 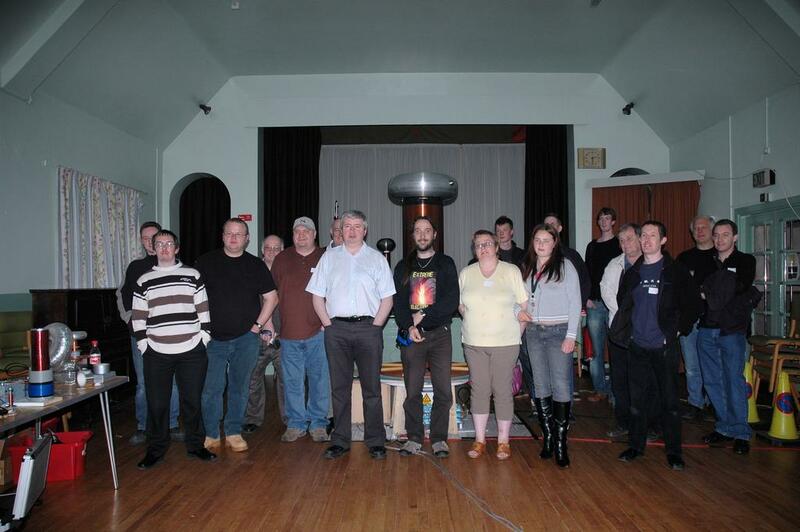 I I have many other photos from this event, If you want more please email me. 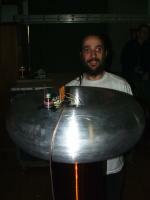 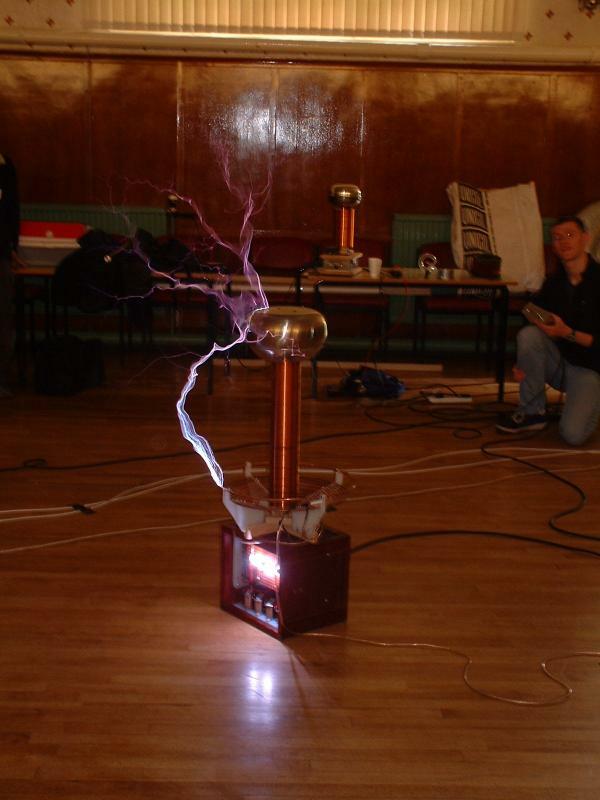 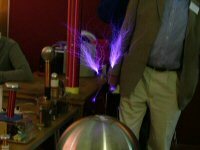 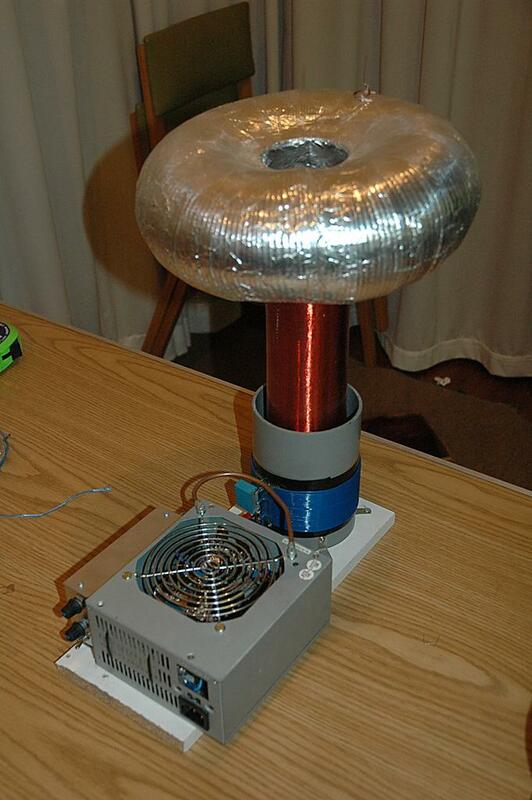 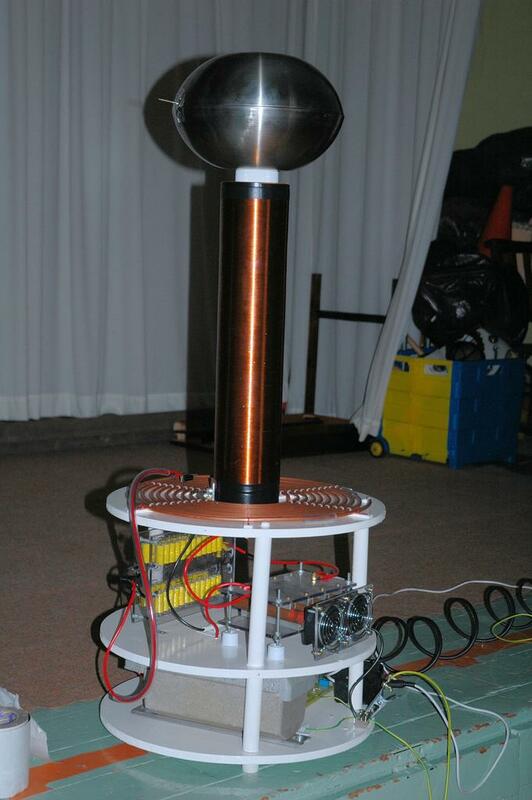 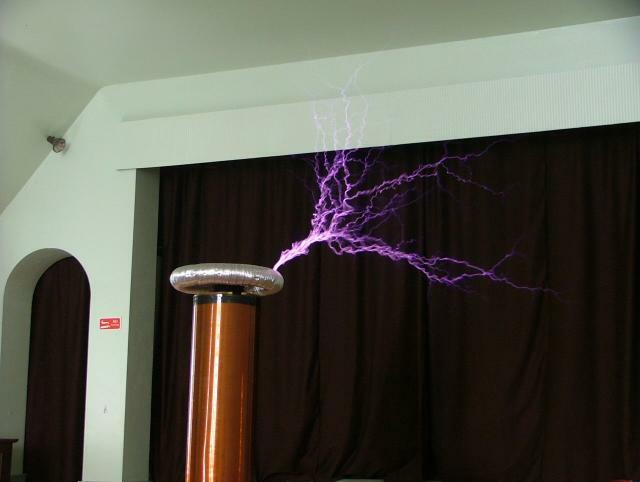 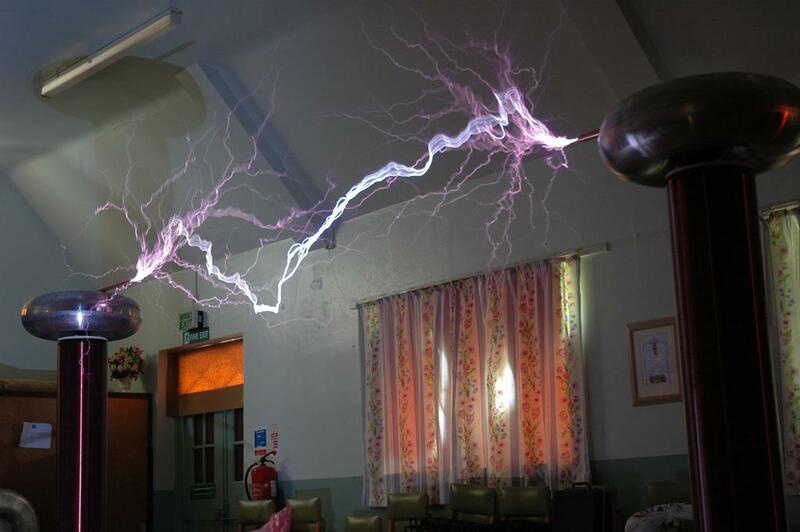 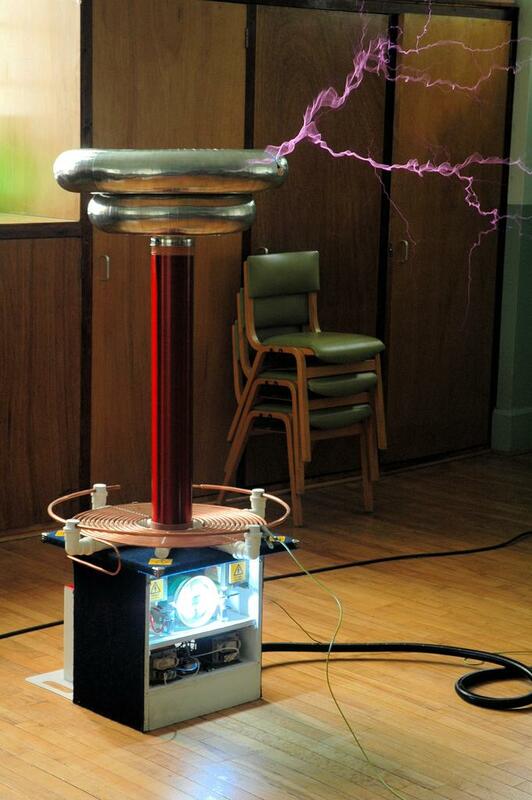 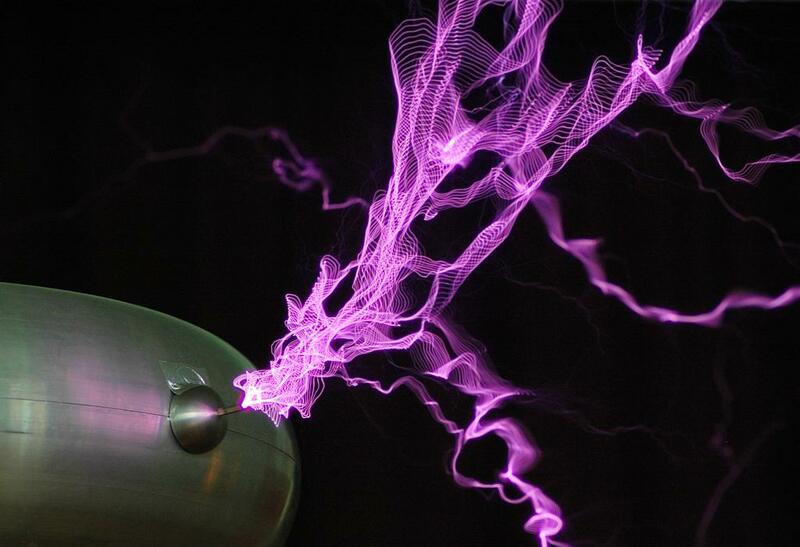 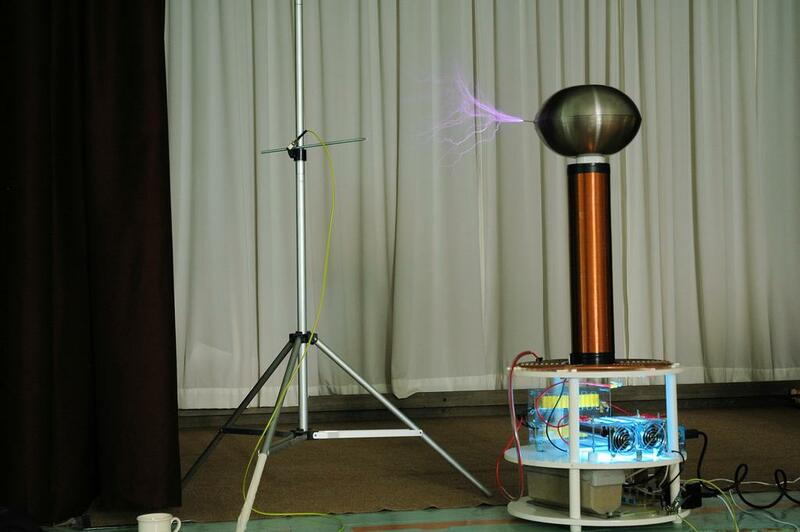 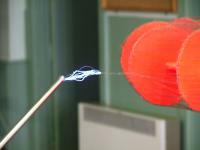 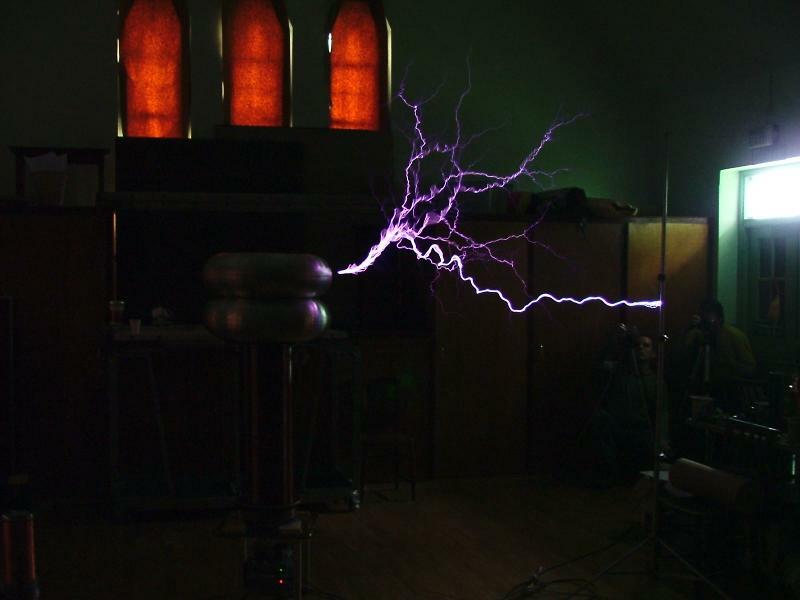 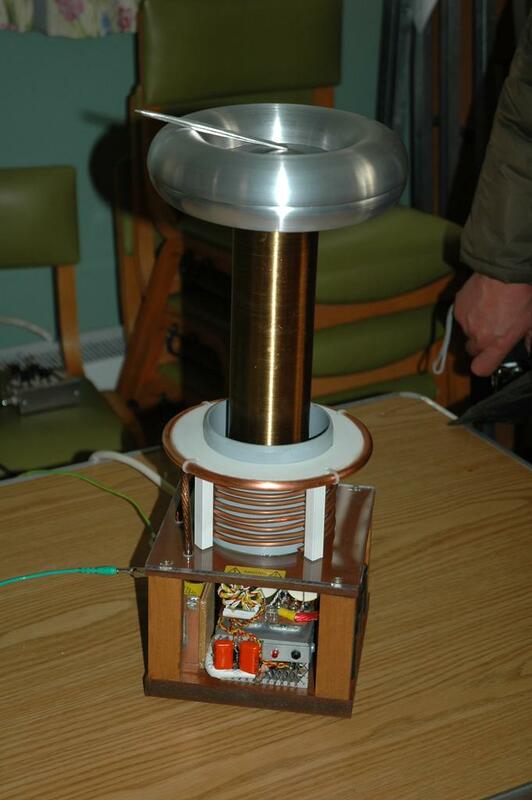 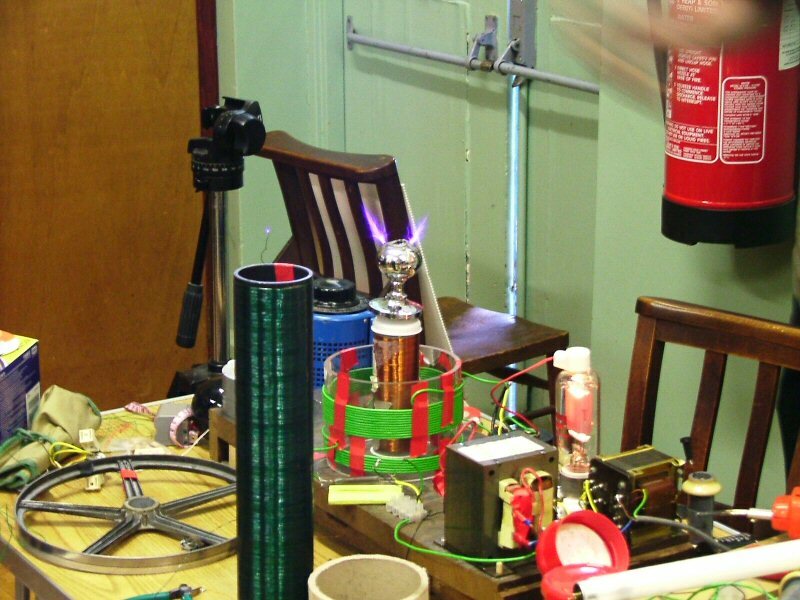 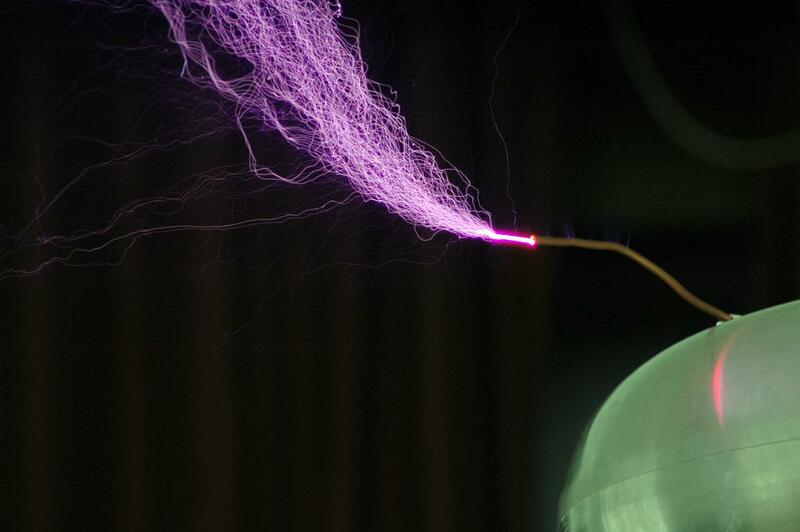 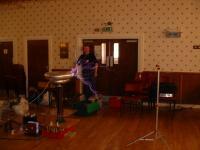 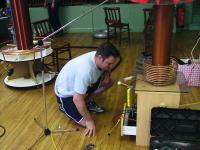 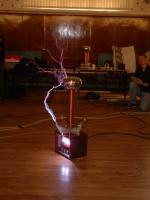 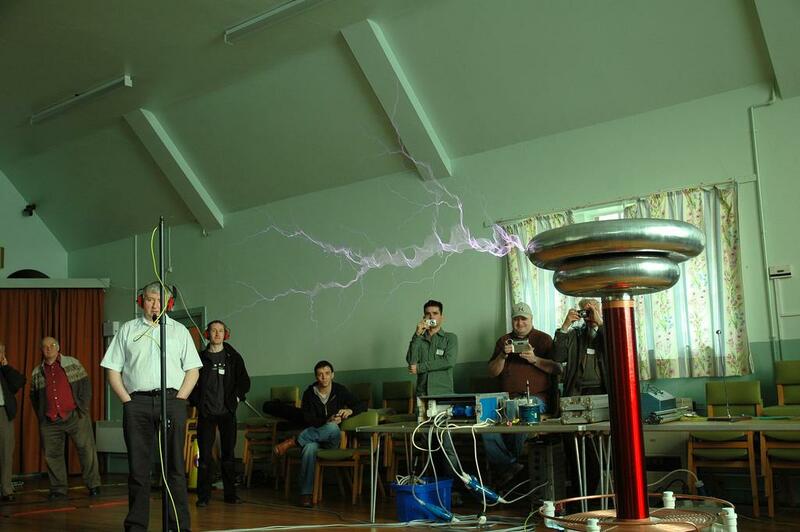 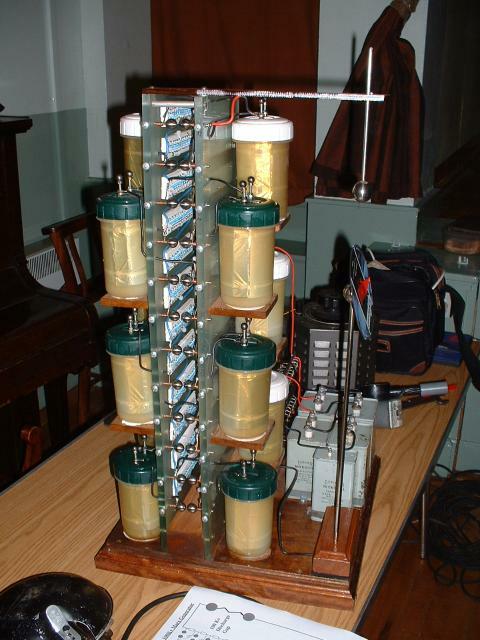 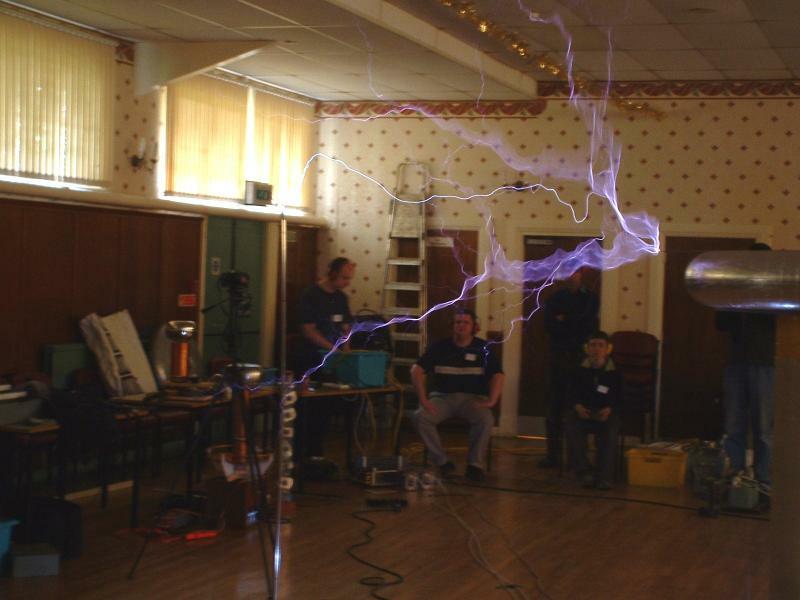 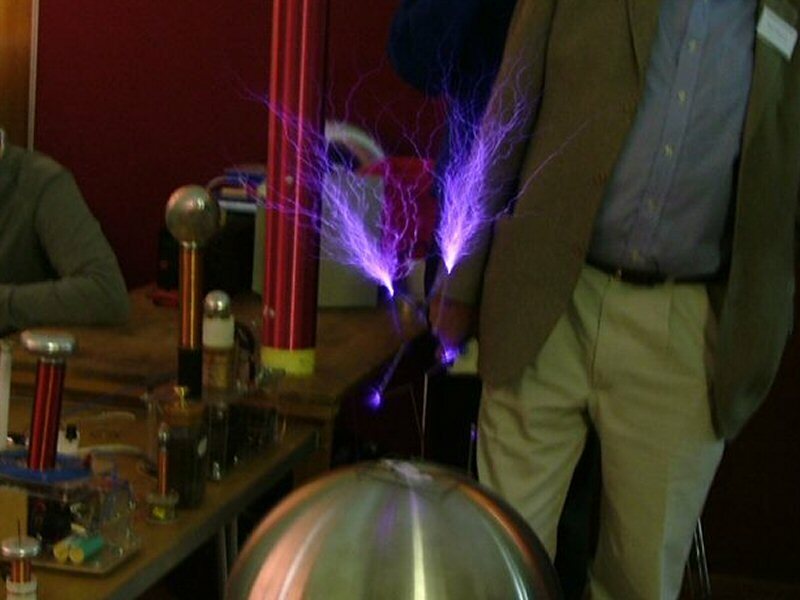 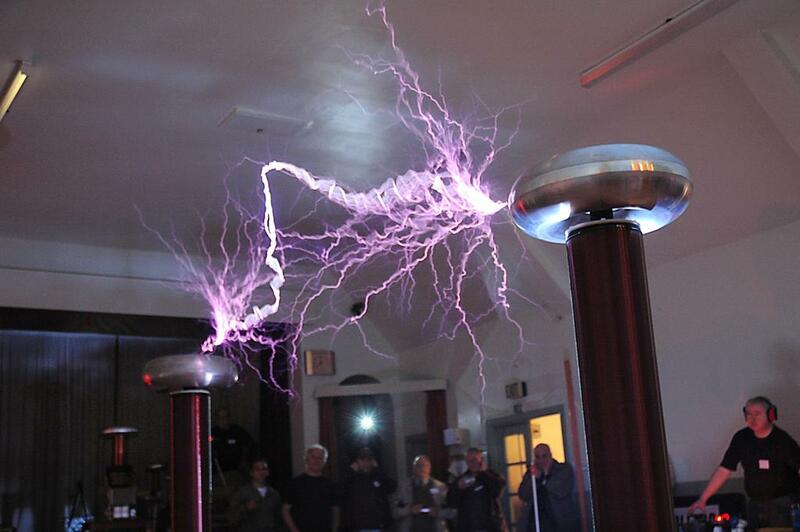 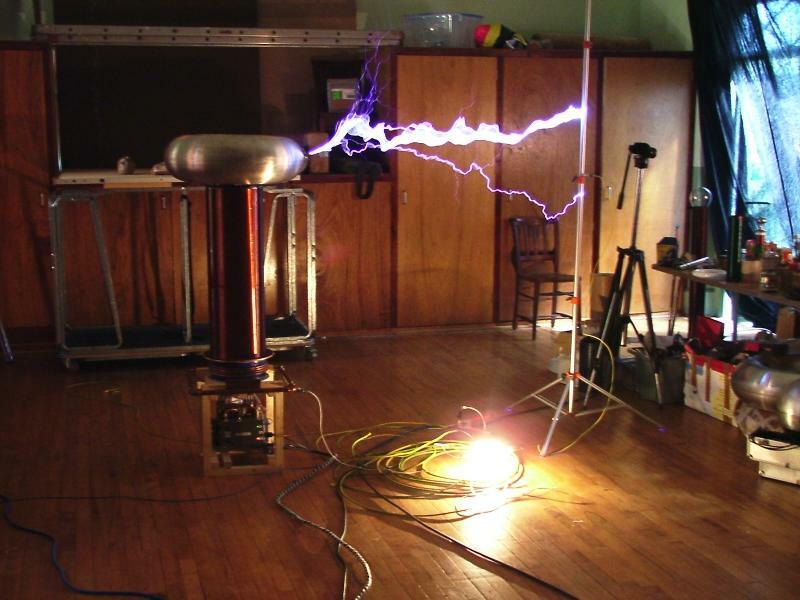 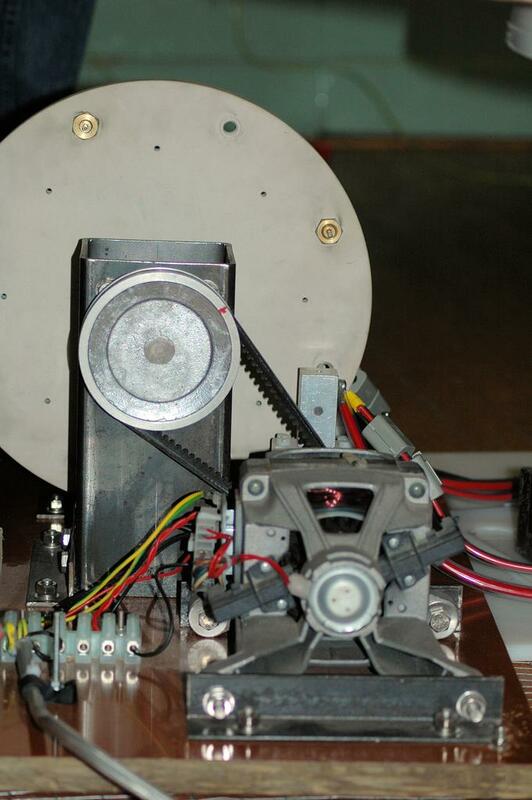 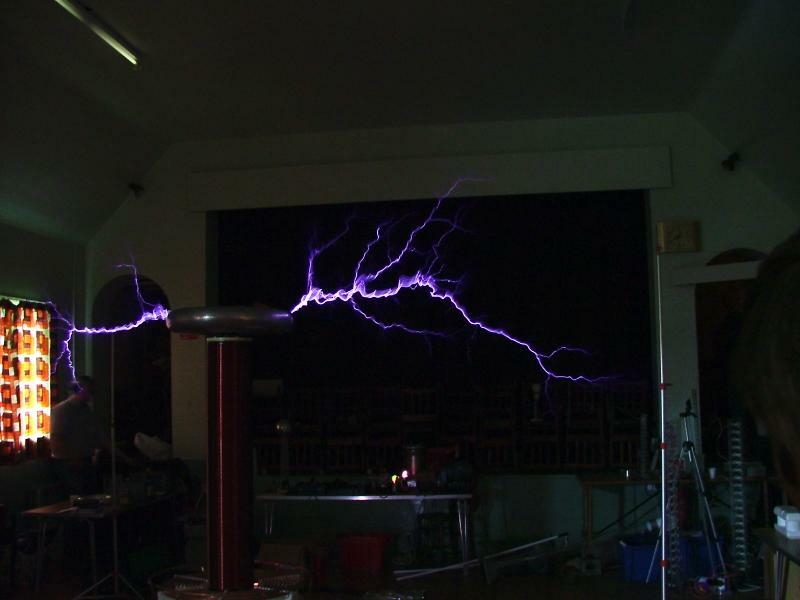 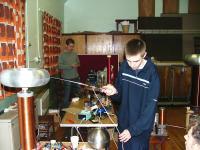 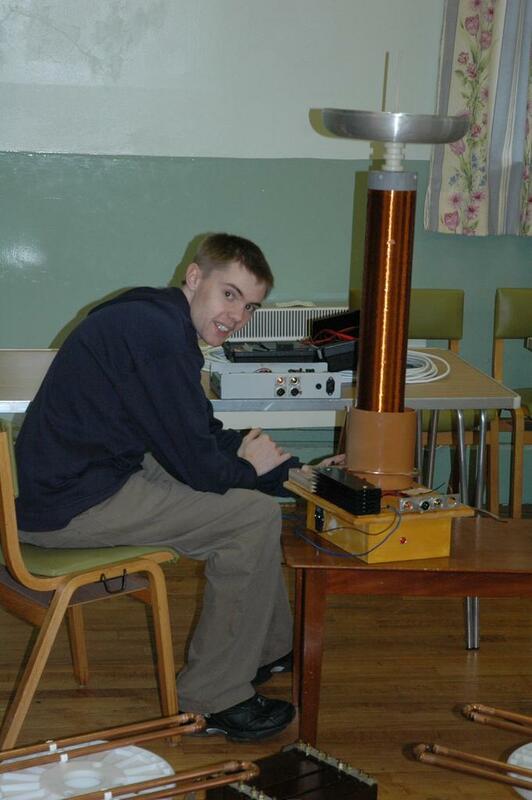 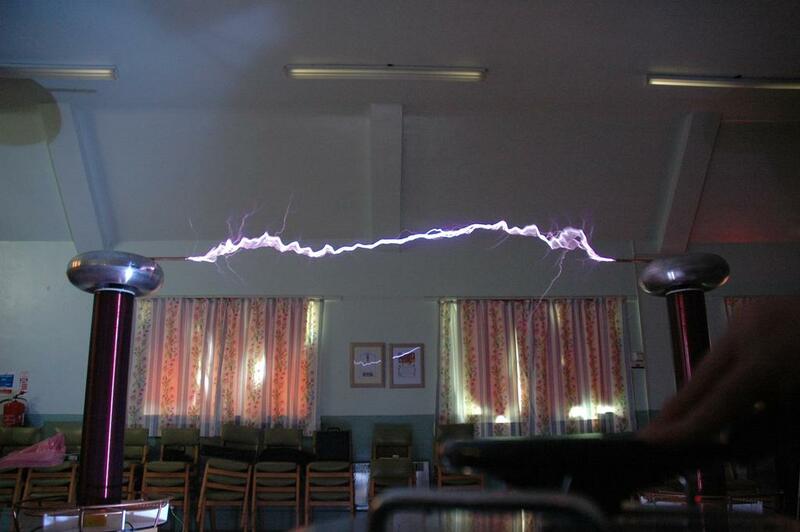 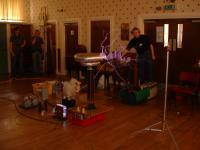 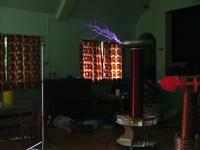 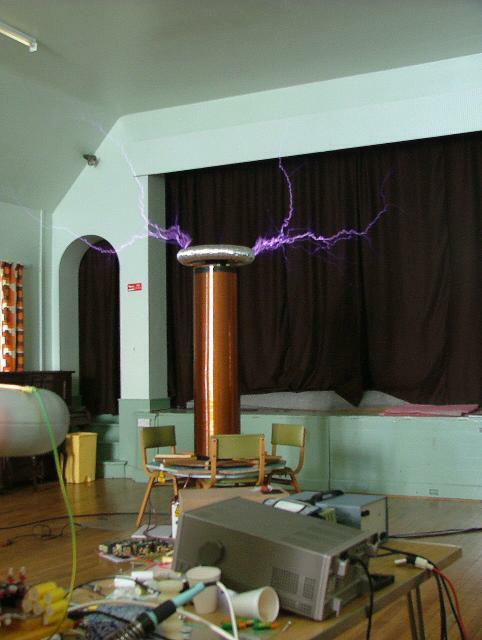 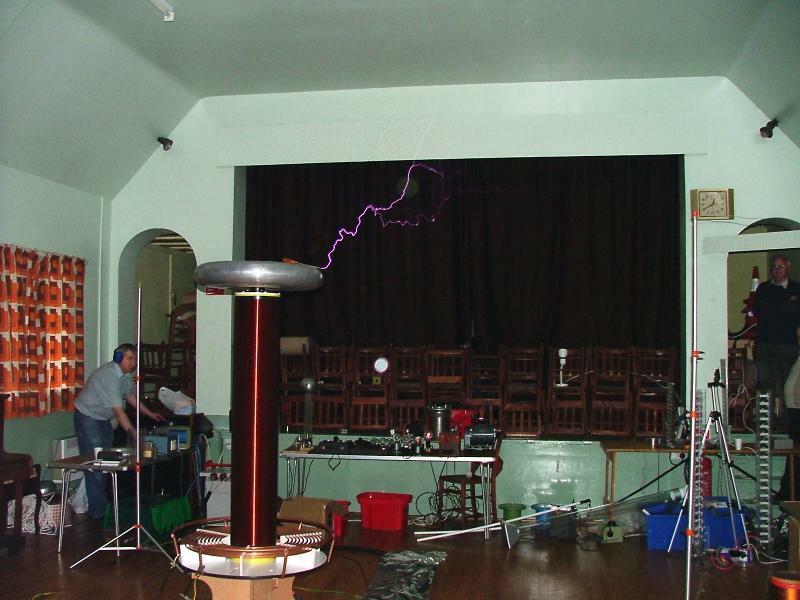 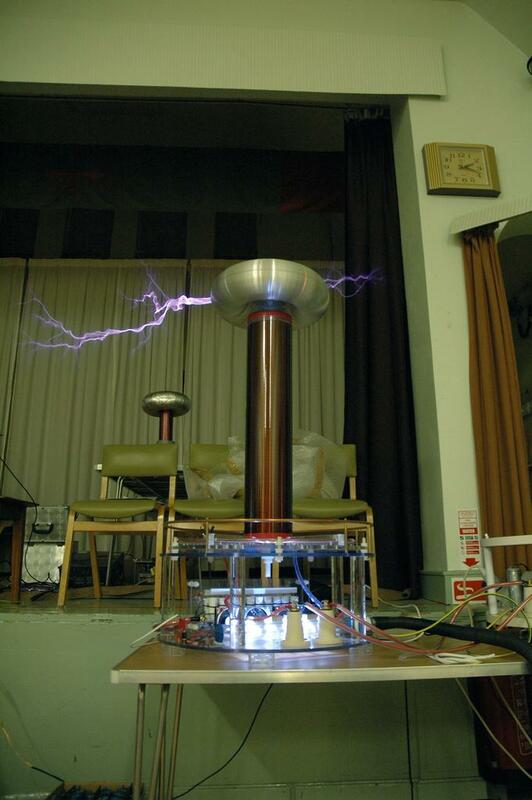 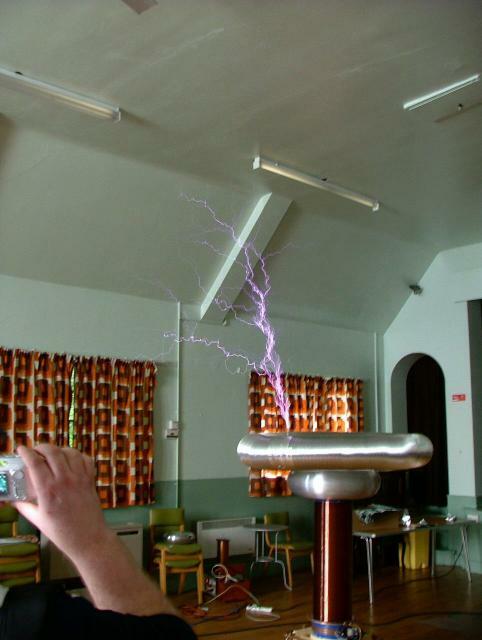 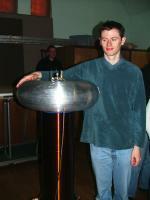 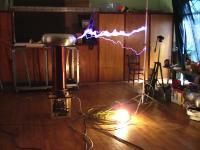 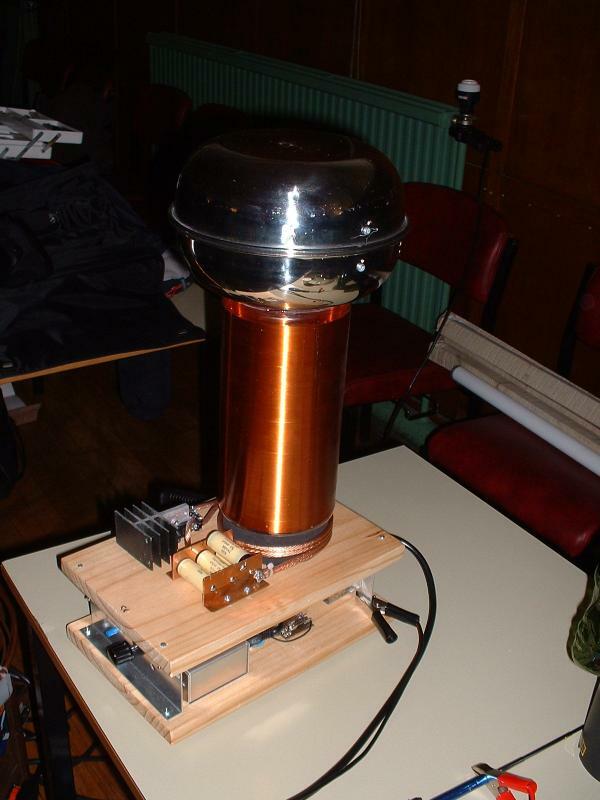 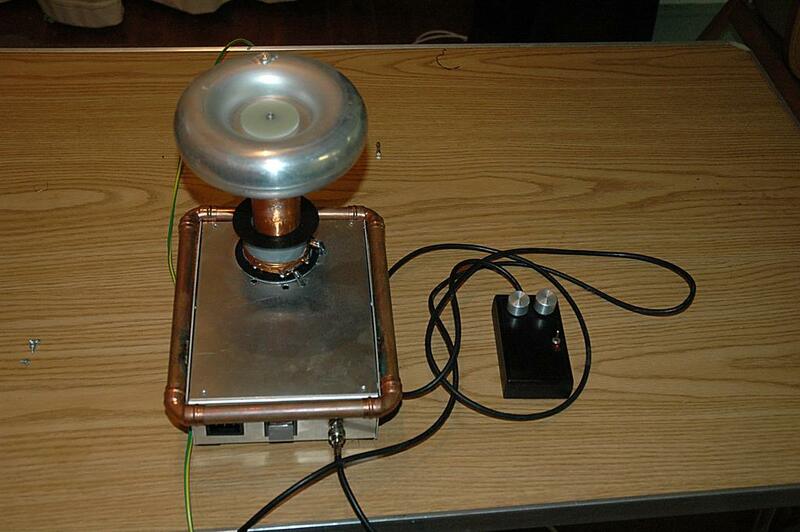 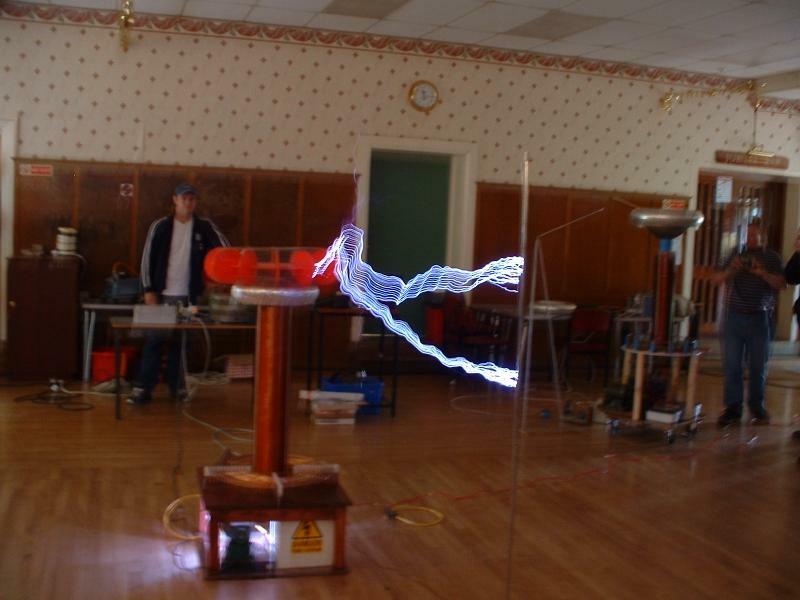 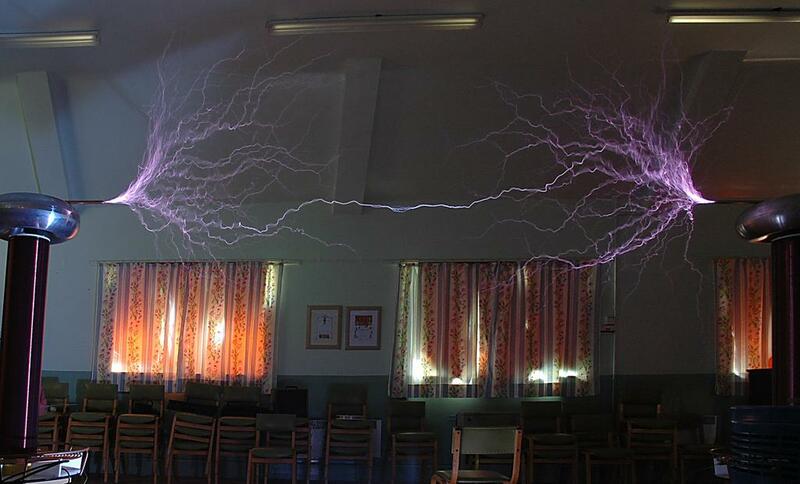 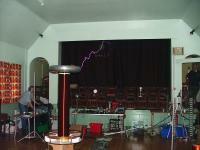 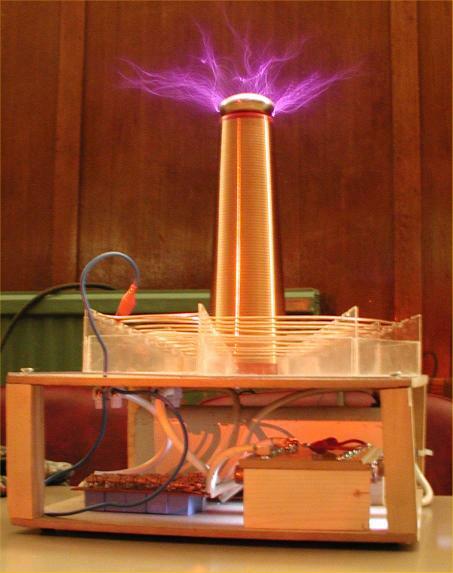 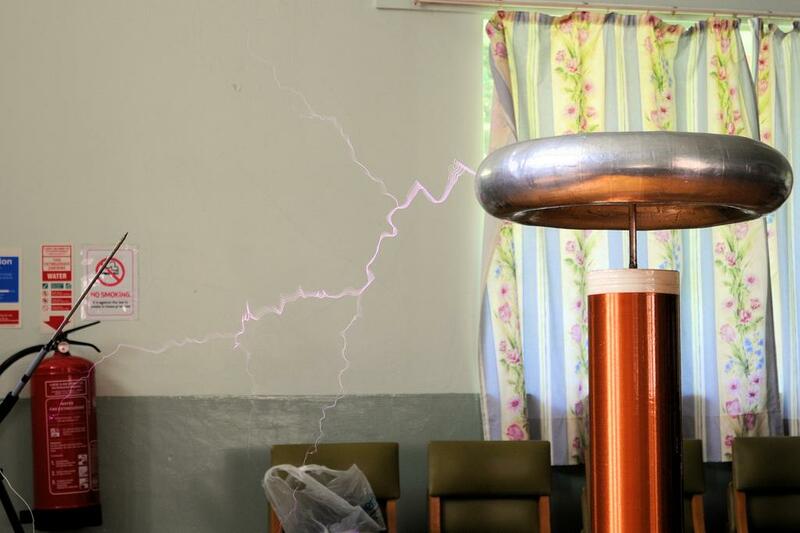 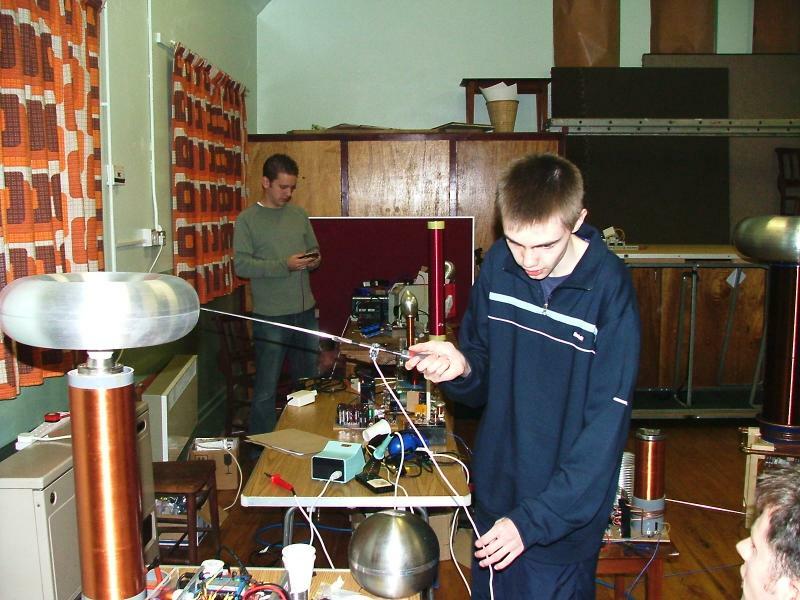 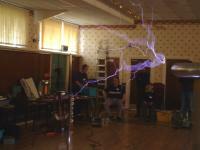 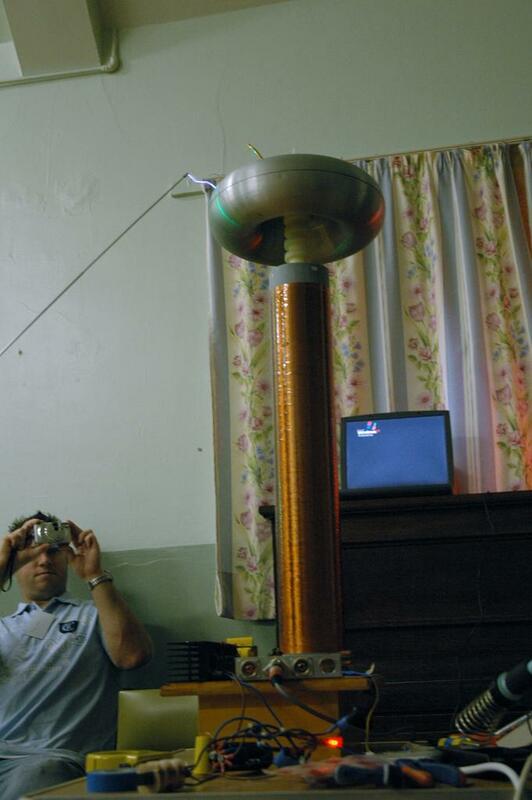 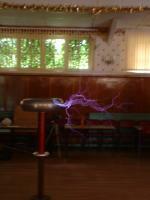 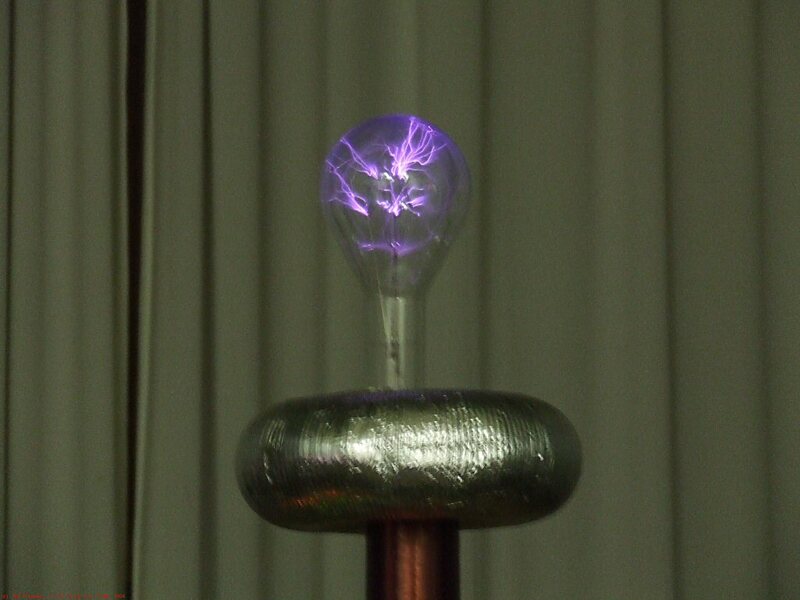 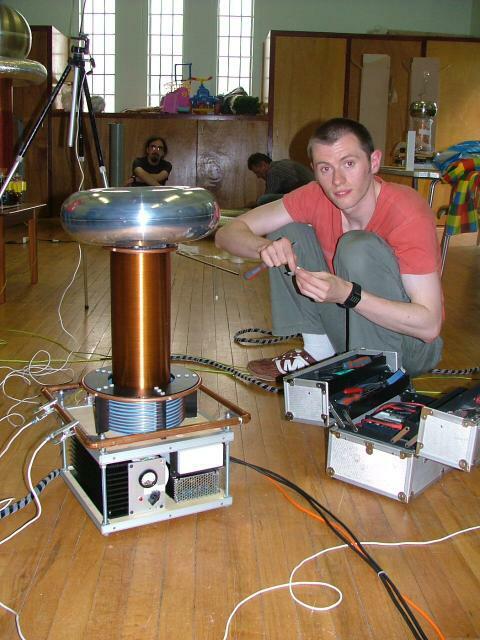 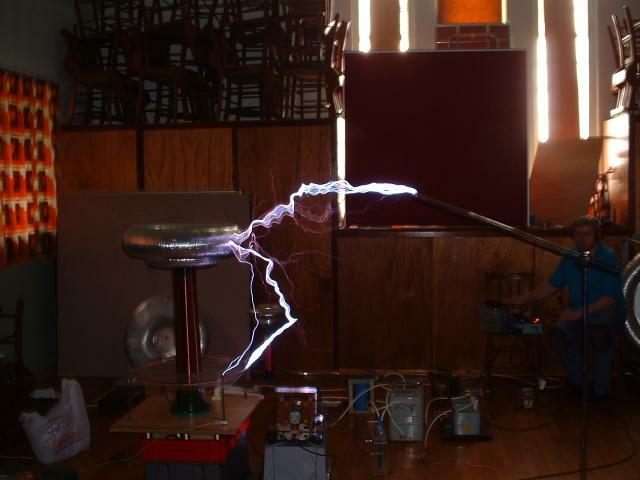 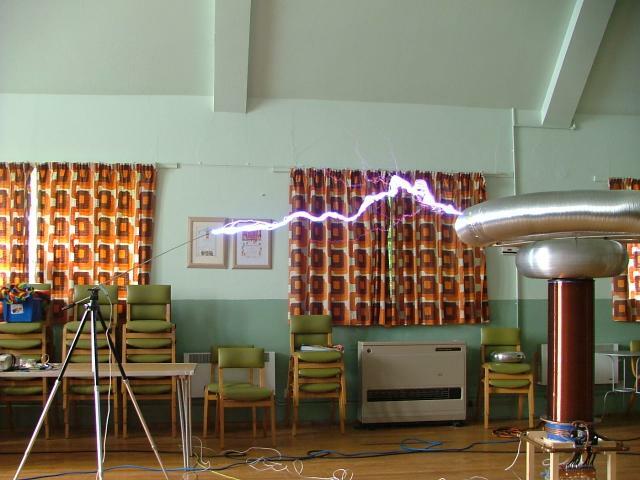 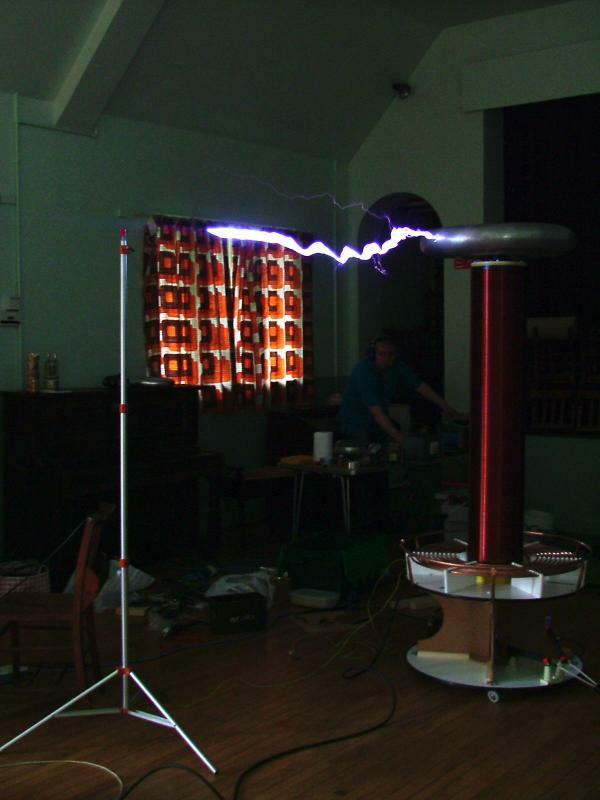 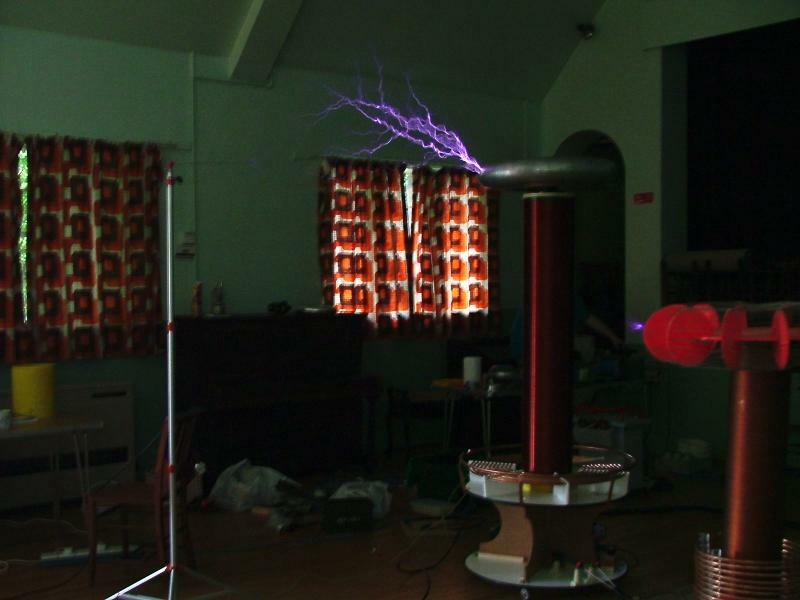 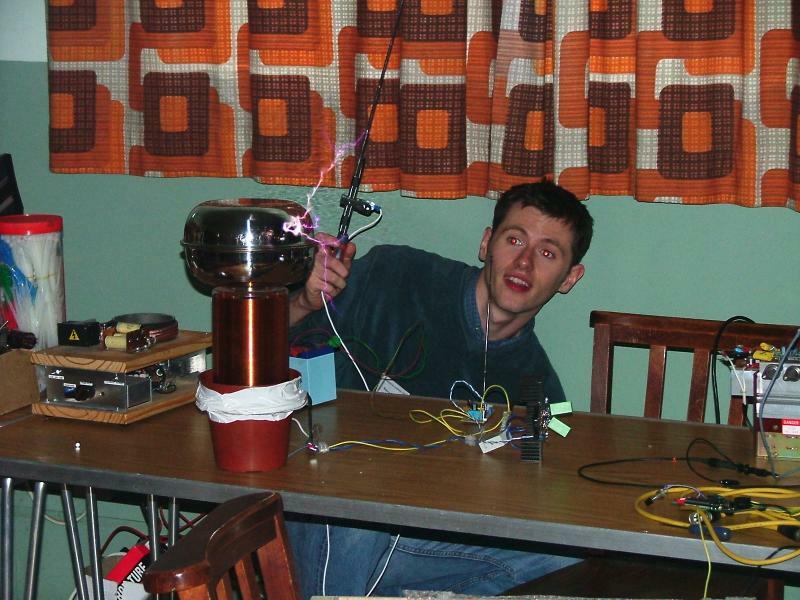 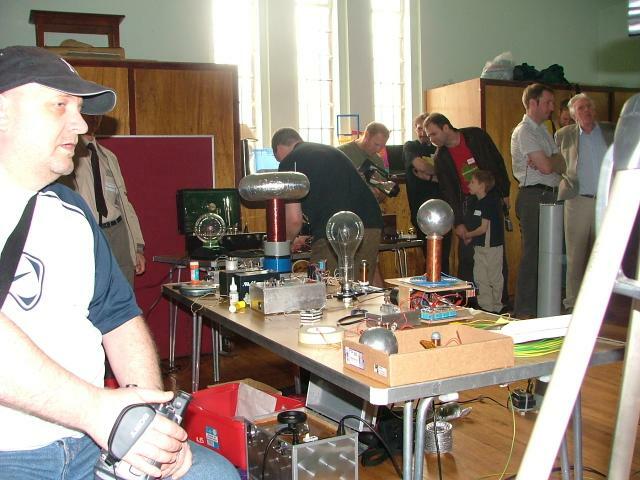 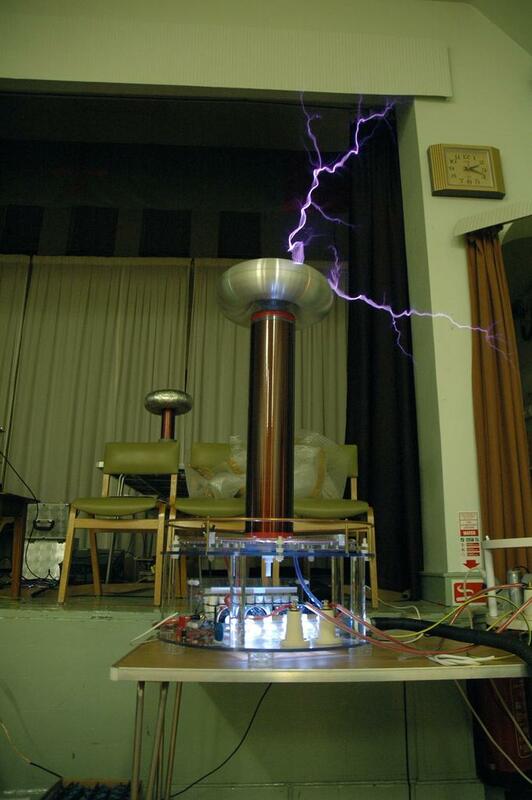 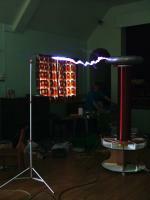 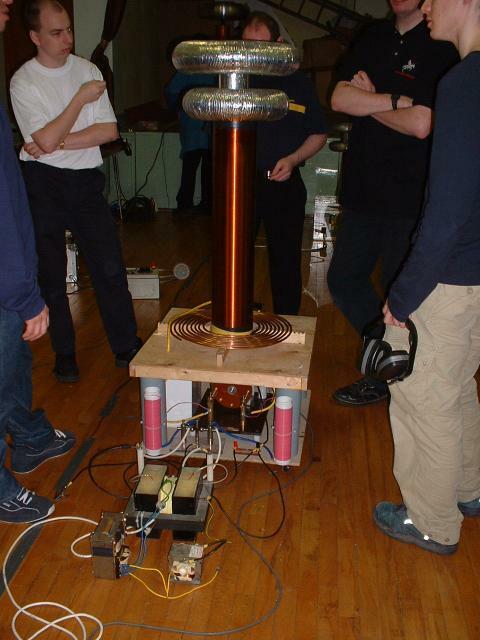 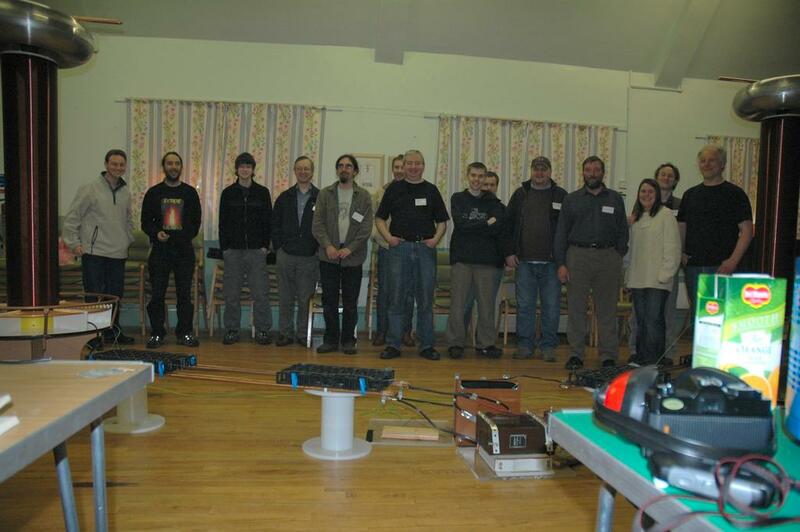 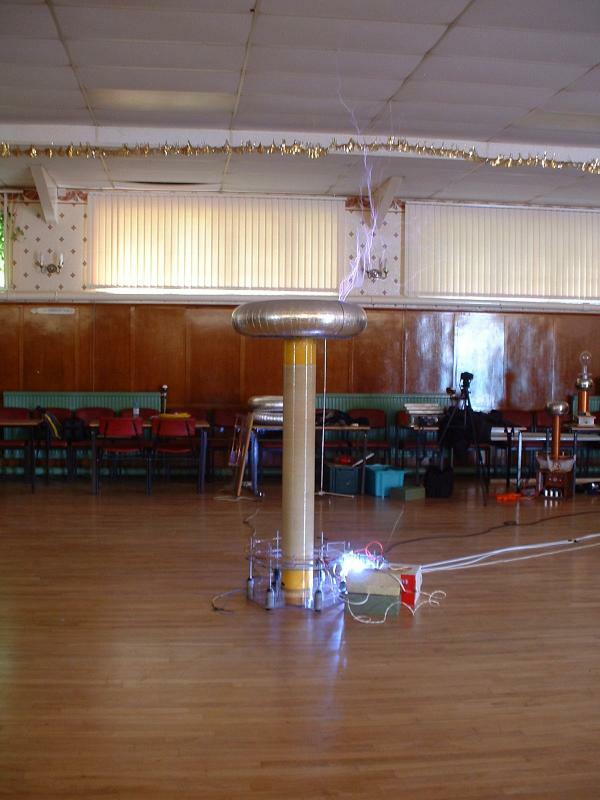 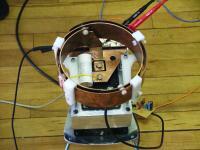 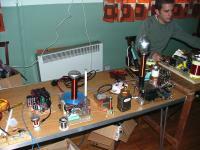 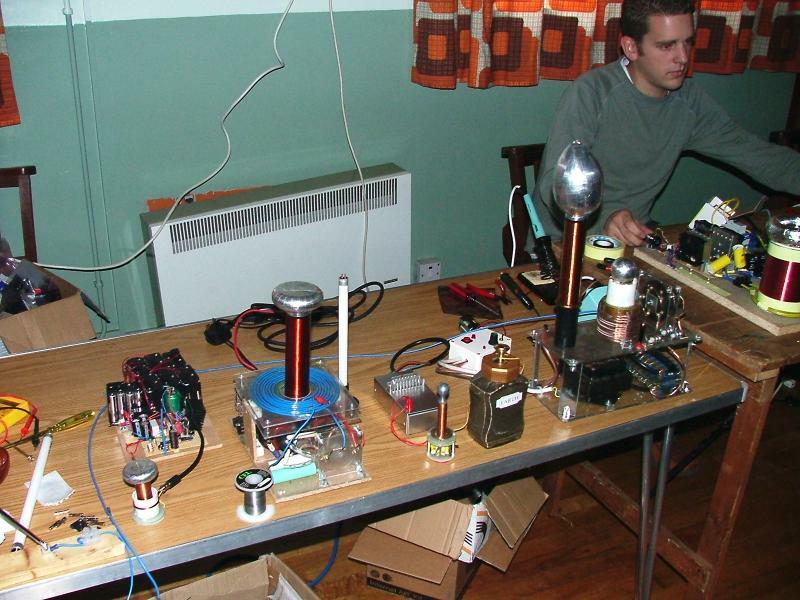 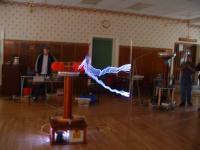 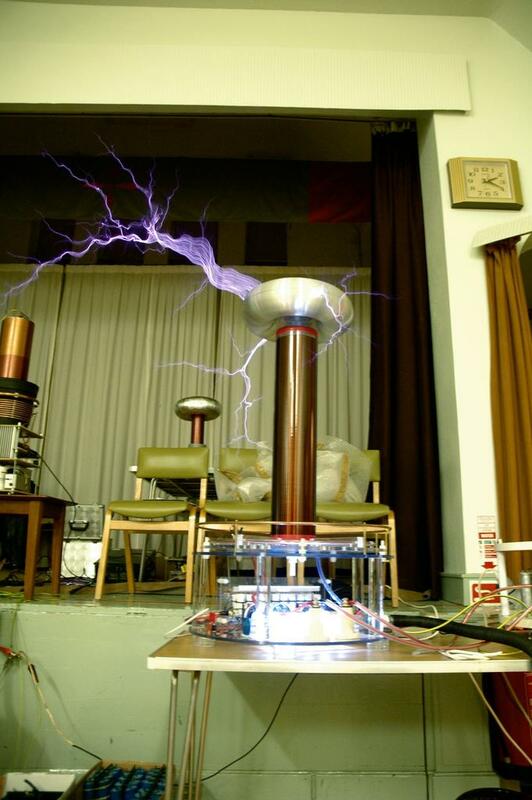 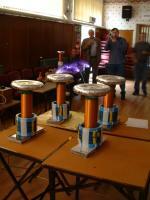 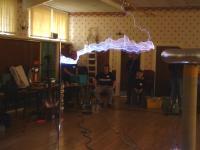 Steve Connors Clasic Tesla coil. 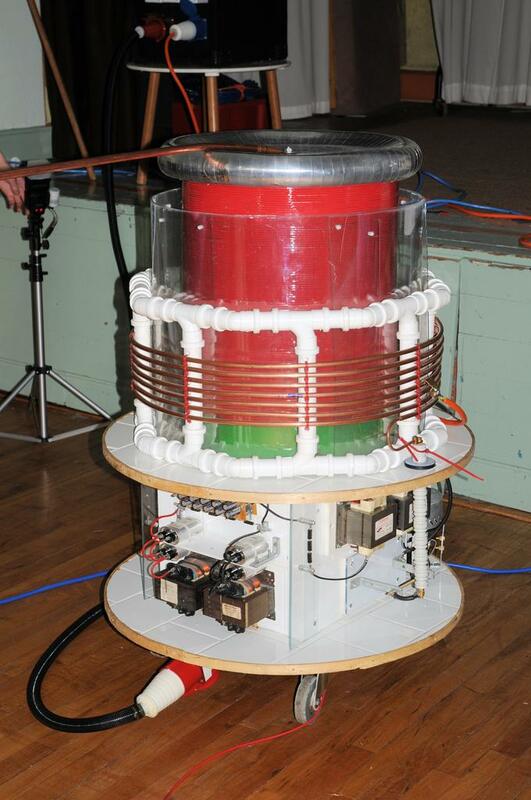 Move from Steve Connors Coil. Brian and Mikes Maggie doing its thing. 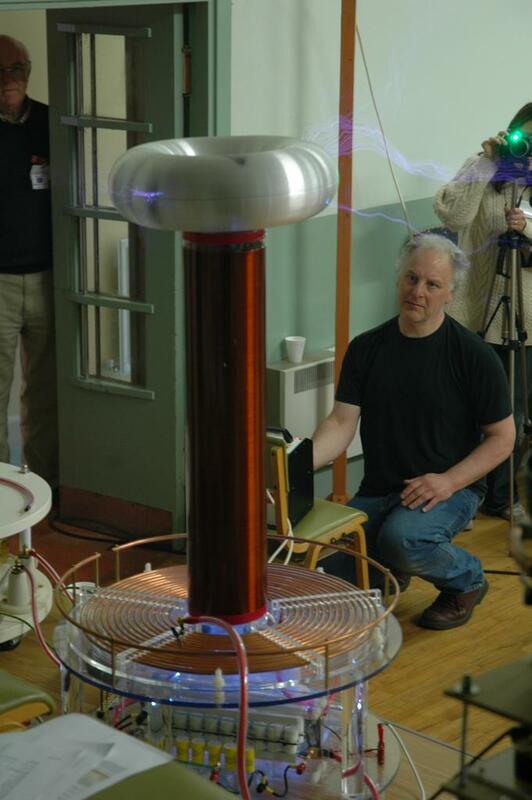 Steve Connors OLTC. 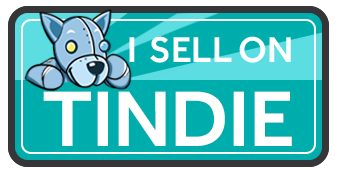 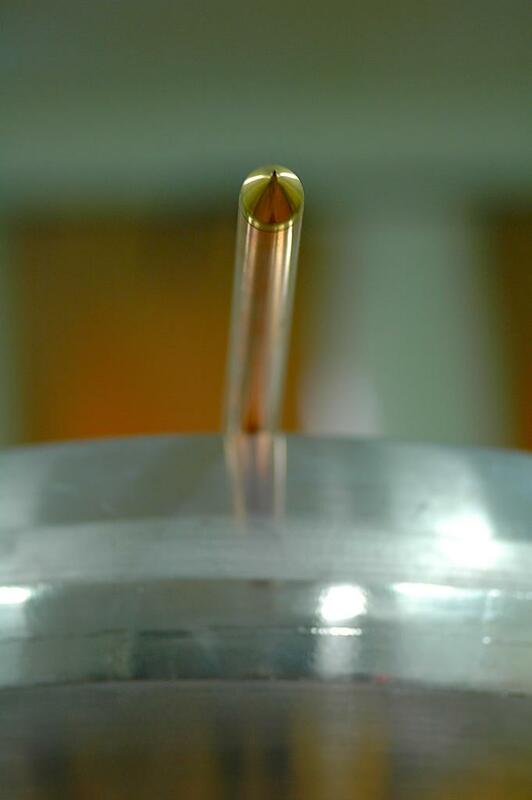 The Second in the world. 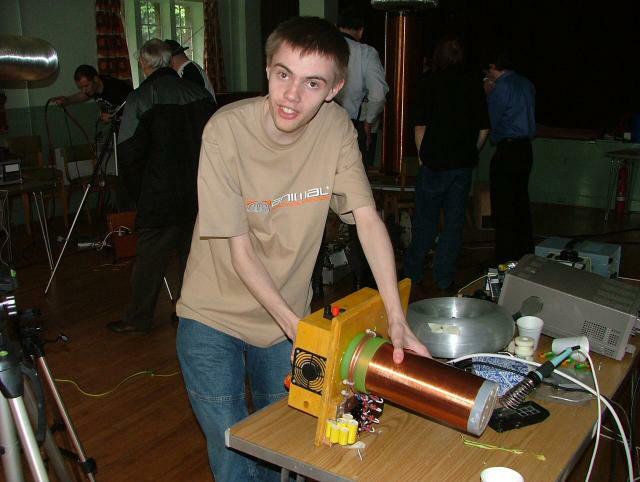 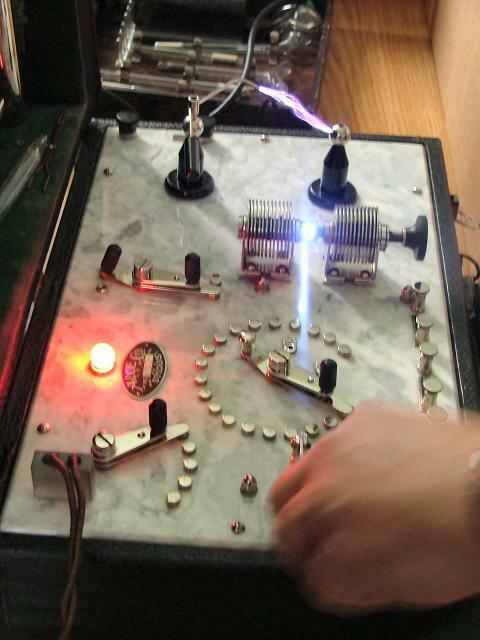 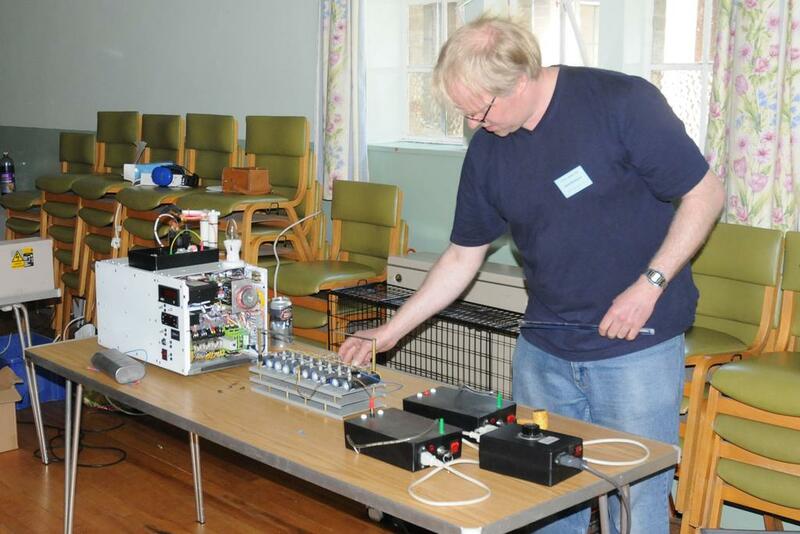 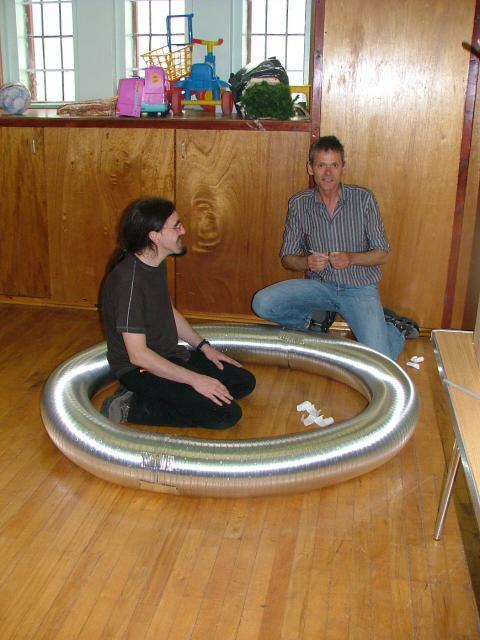 Martin Dale, Preparing His Coil. 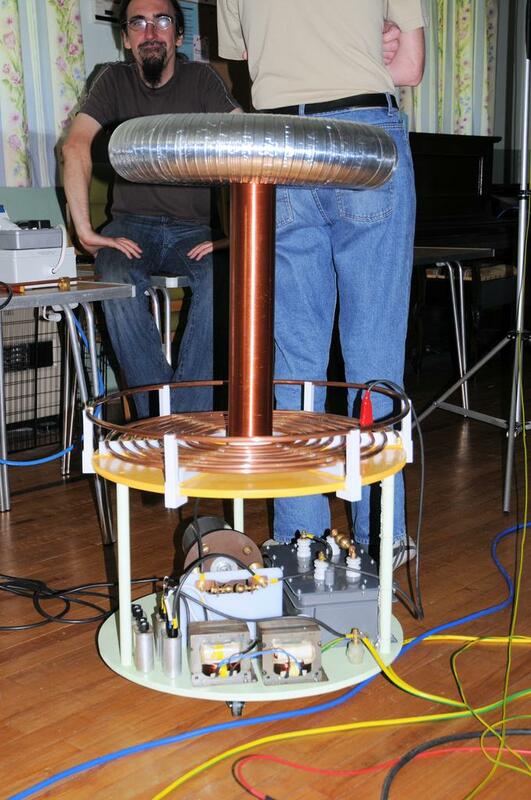 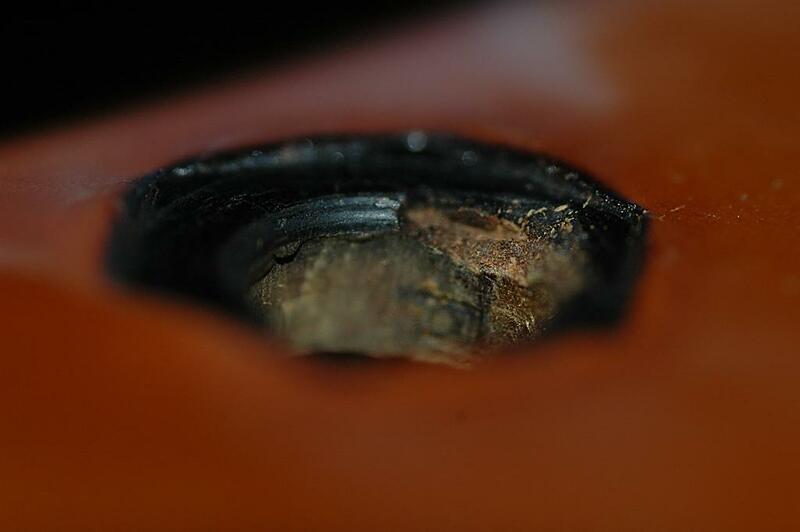 Martin Dales Coil in action. 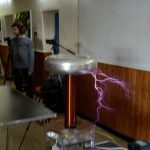 A Few Pictures from the Derby Teslathon, the first Teslathon I visited. 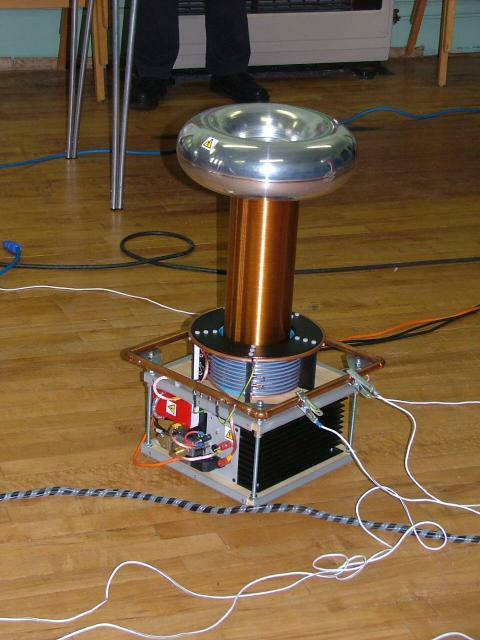 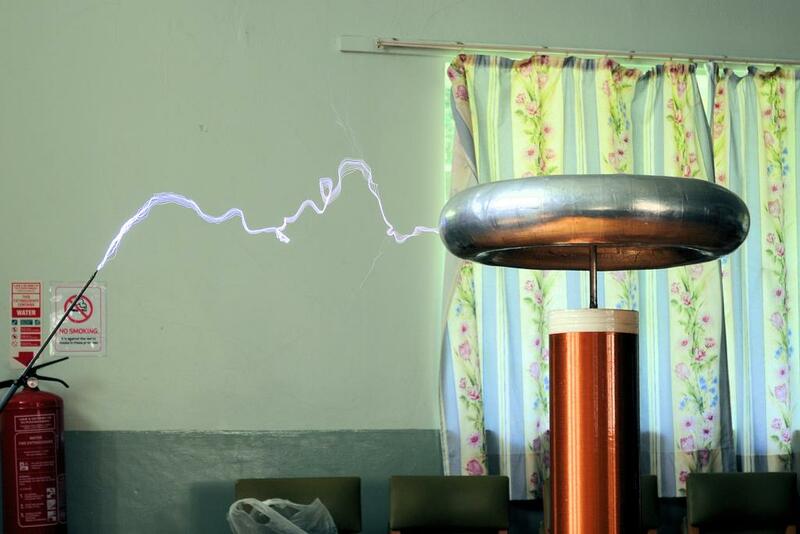 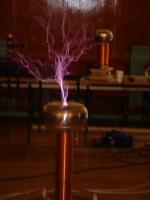 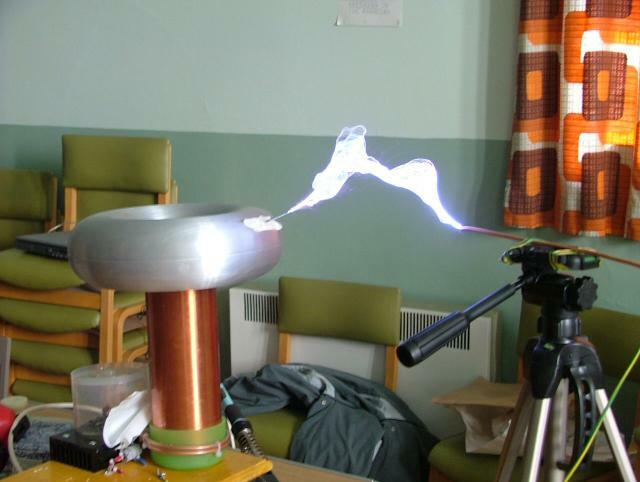 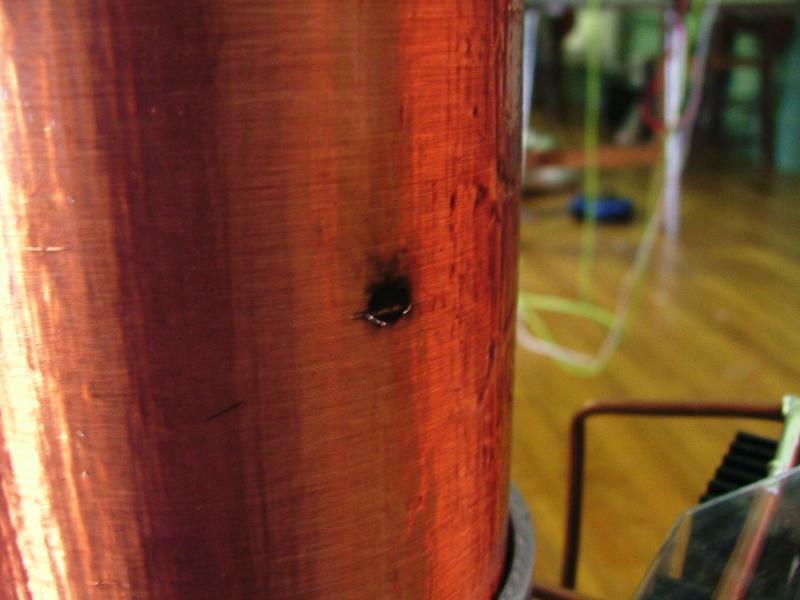 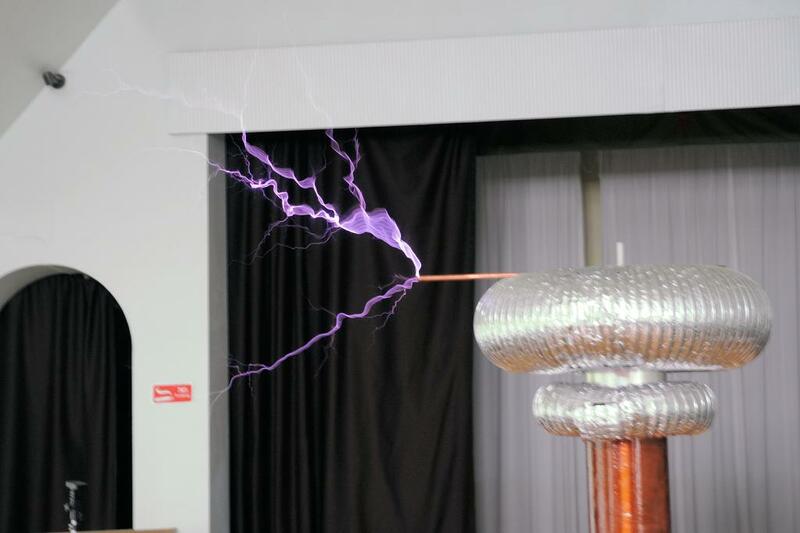 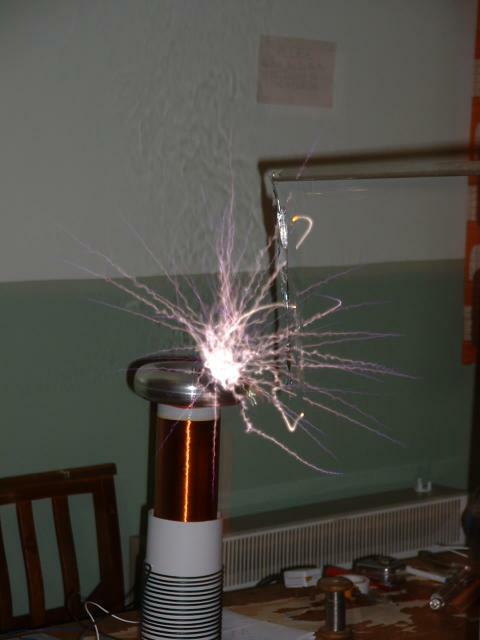 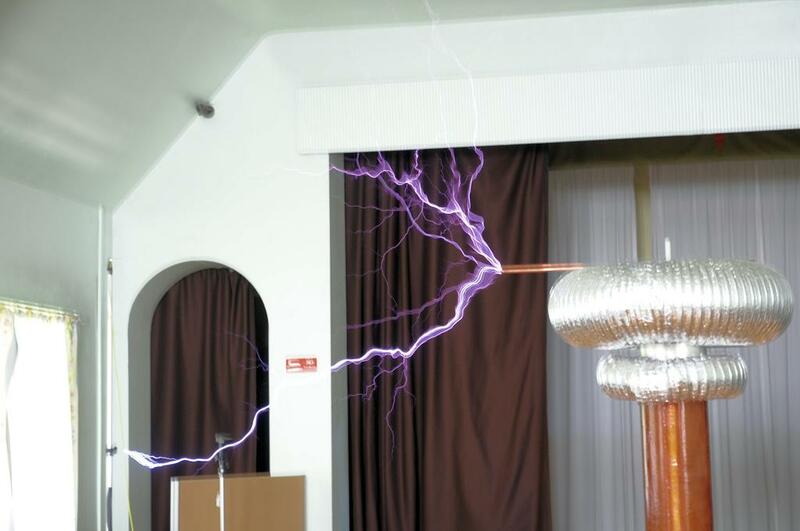 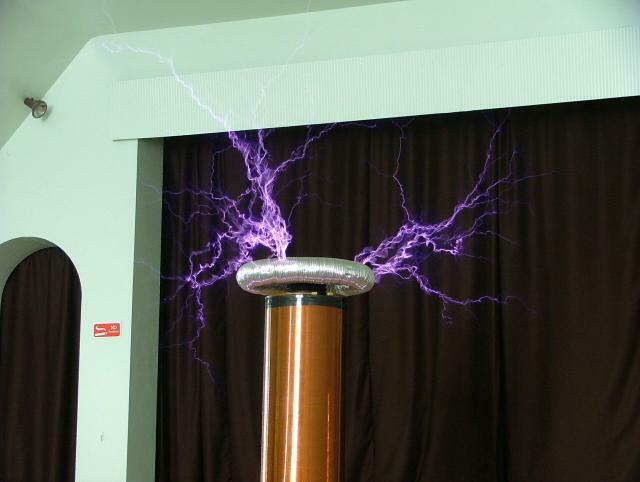 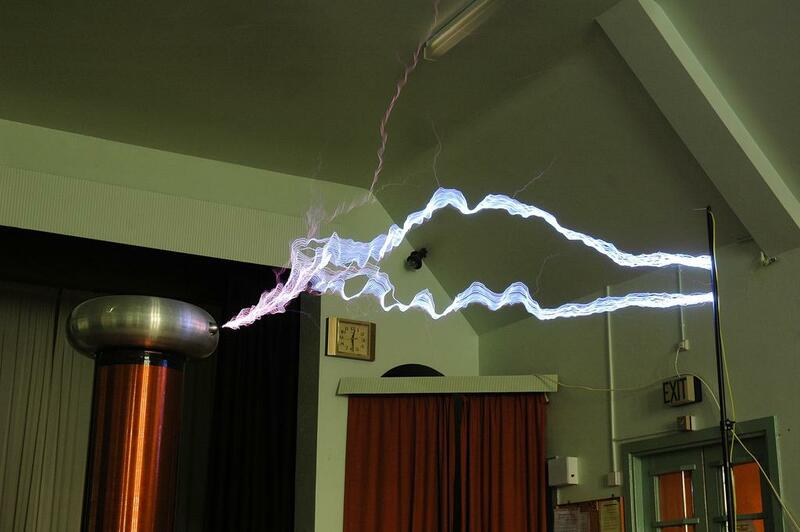 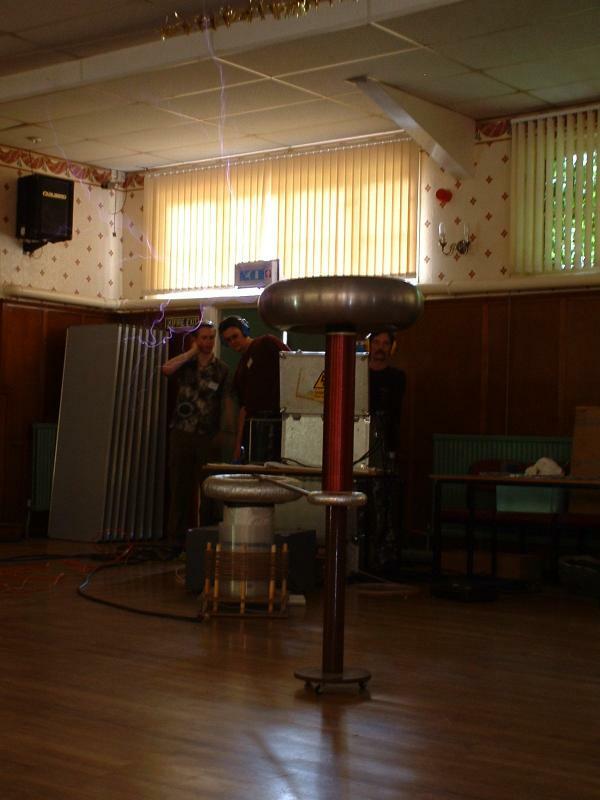 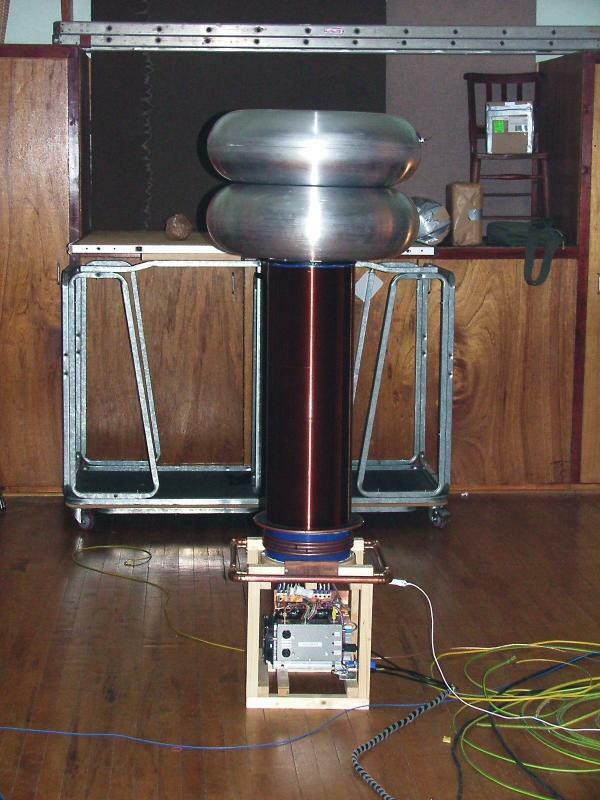 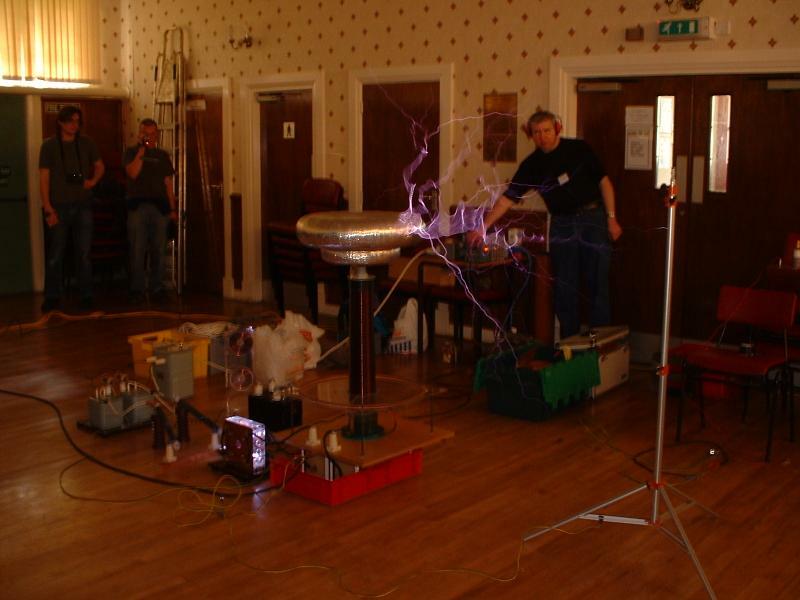 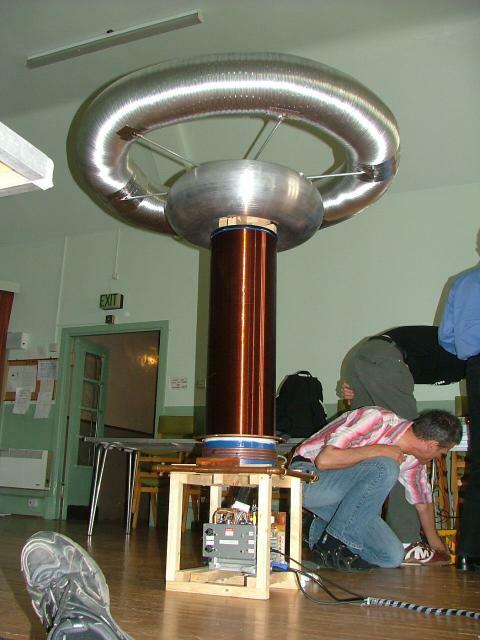 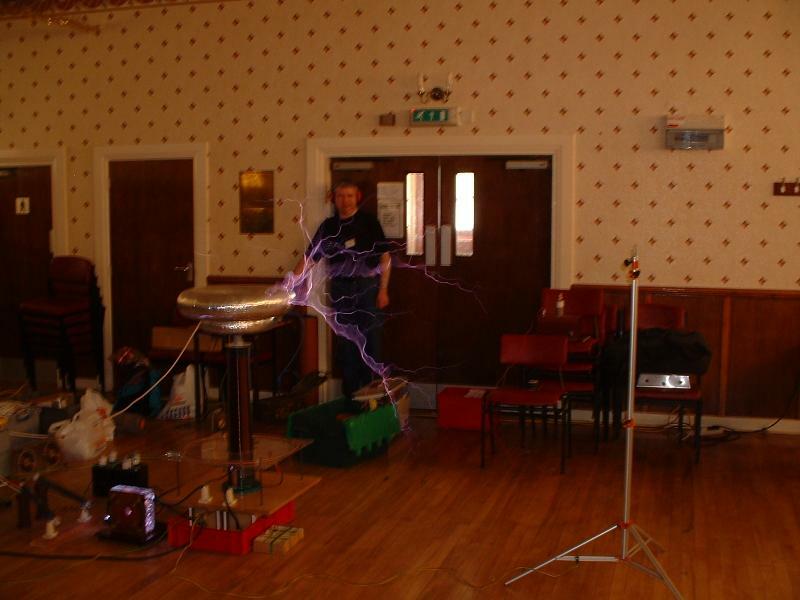 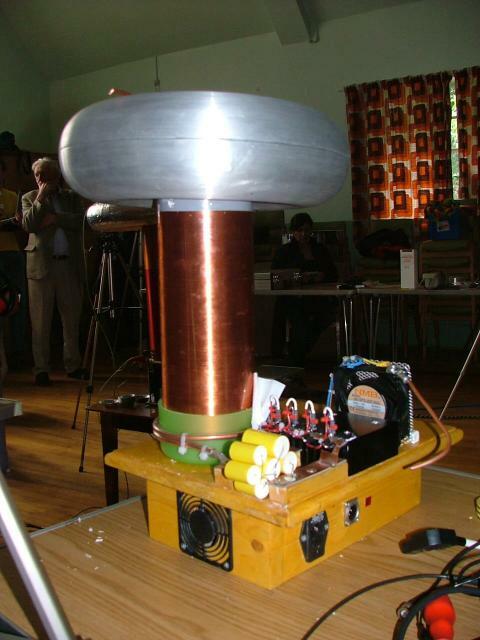 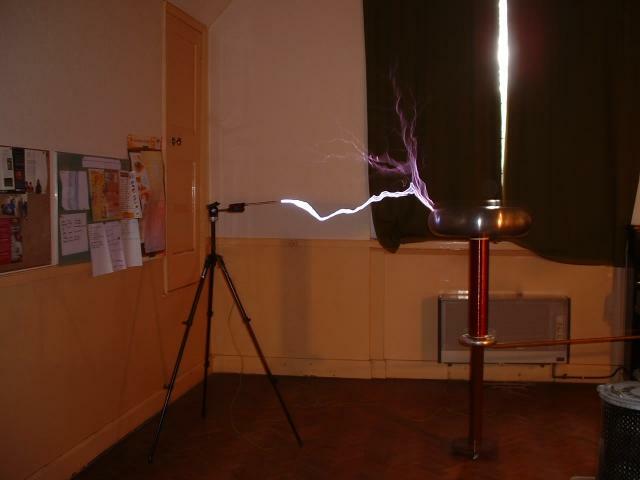 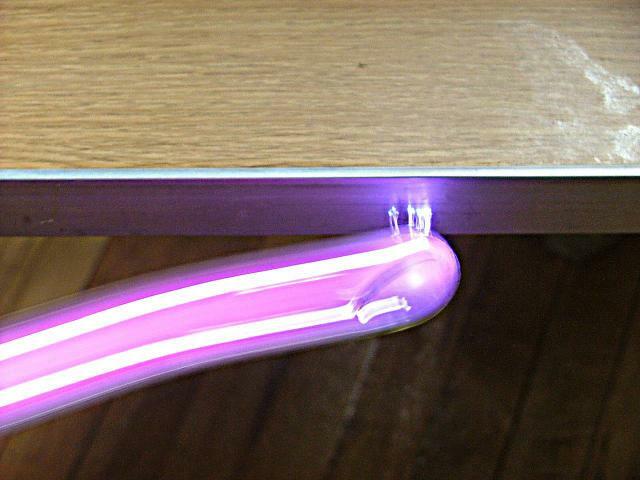 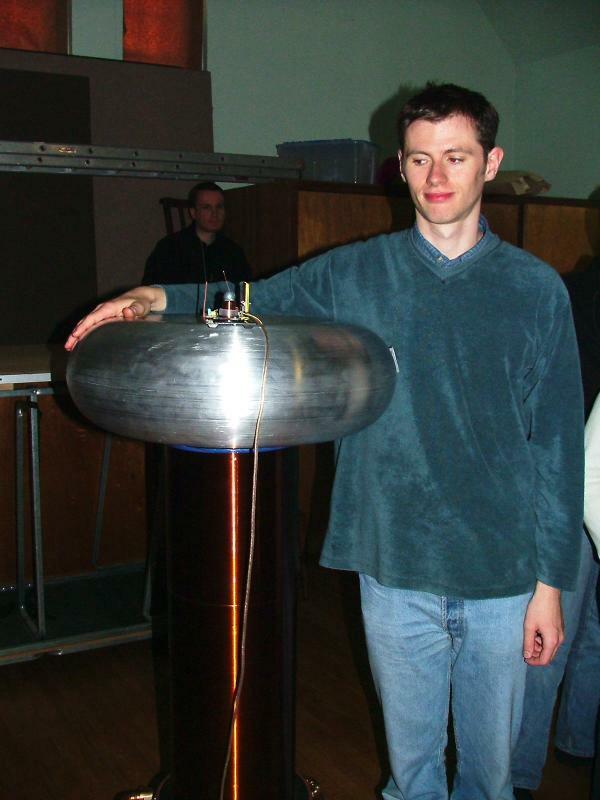 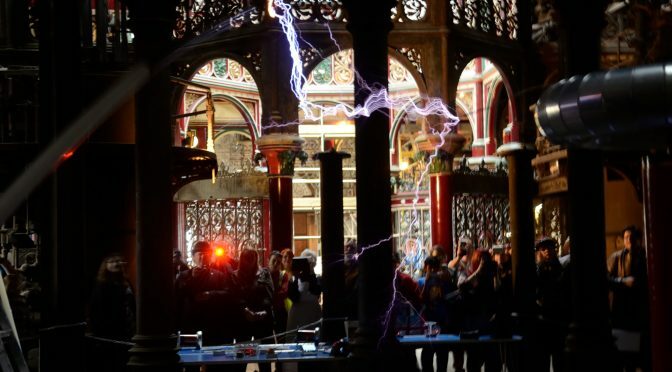 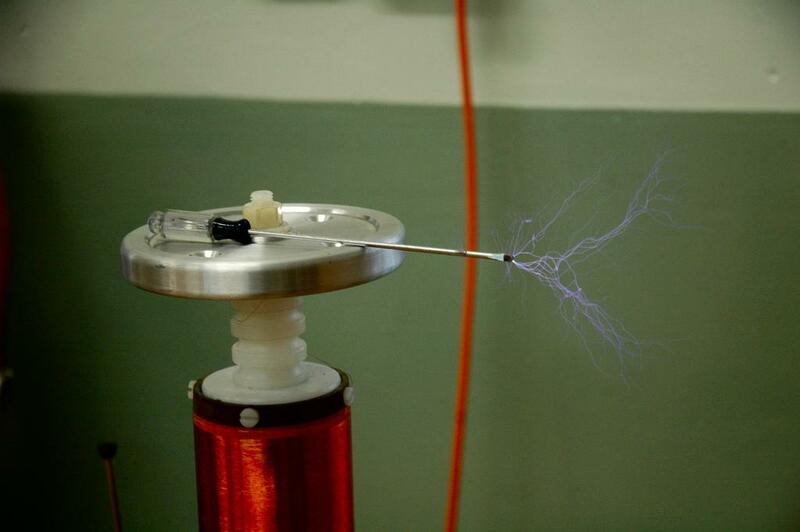 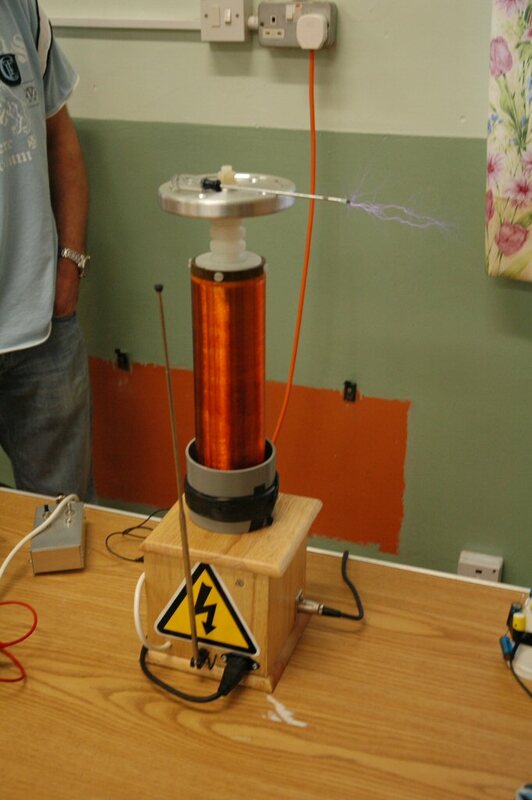 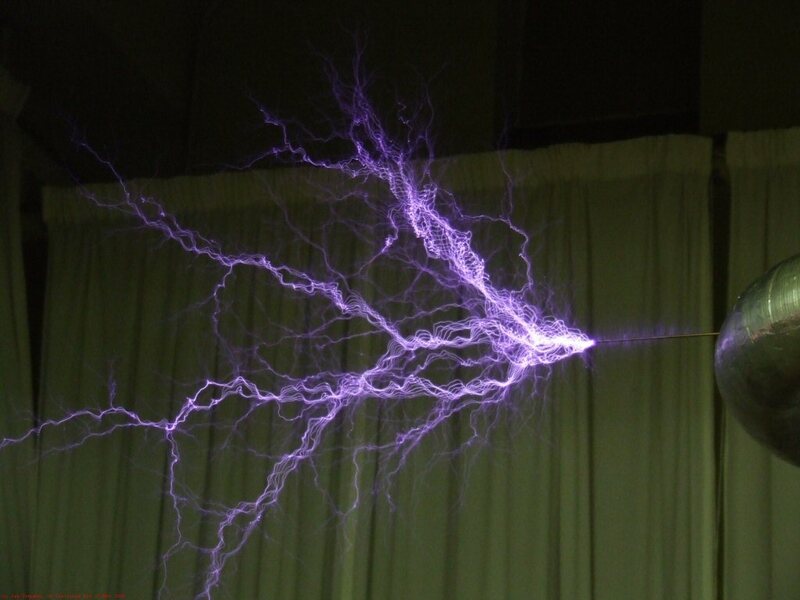 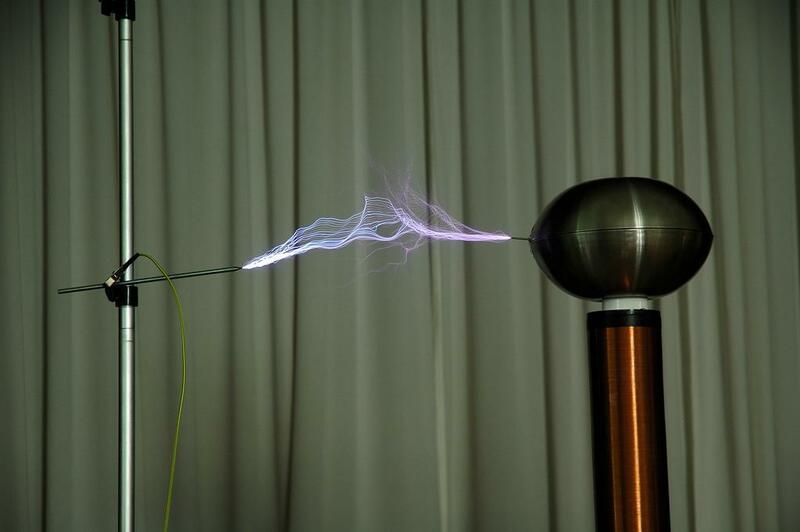 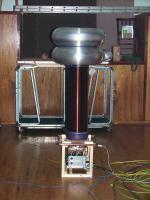 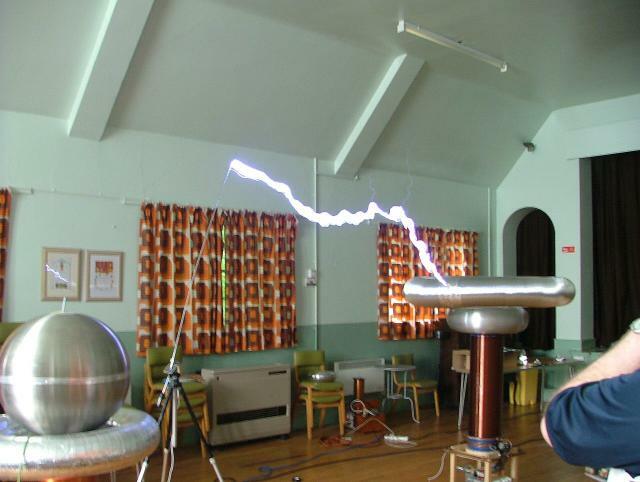 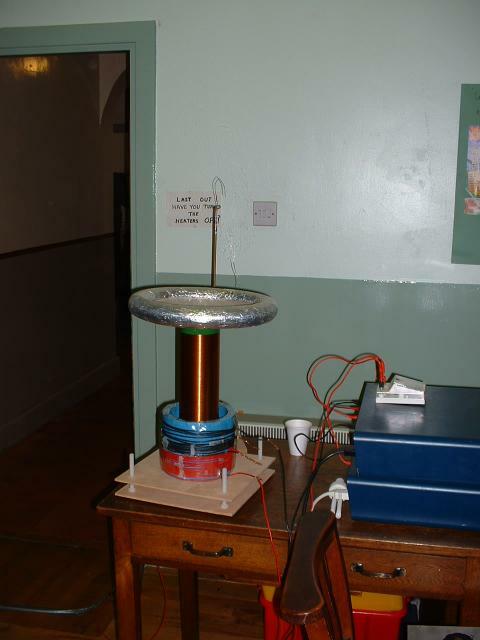 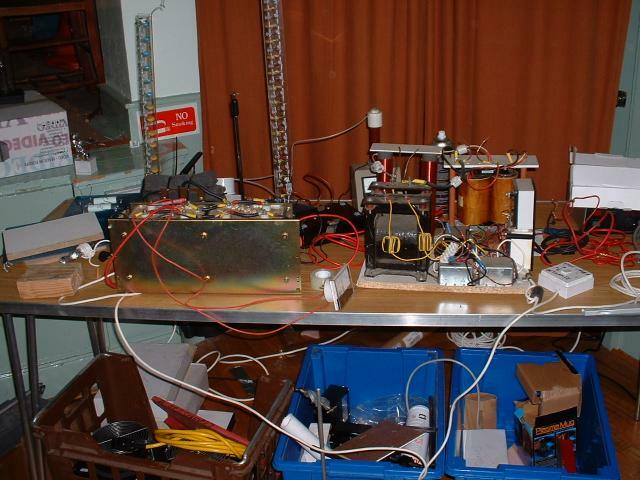 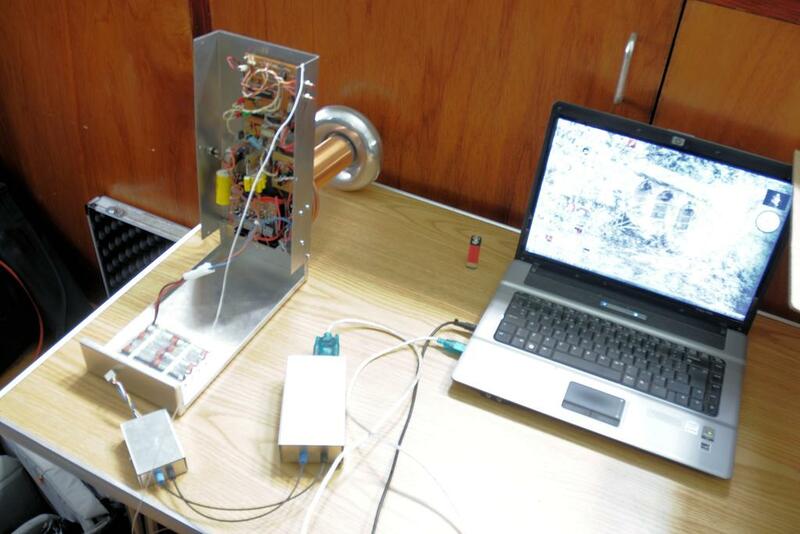 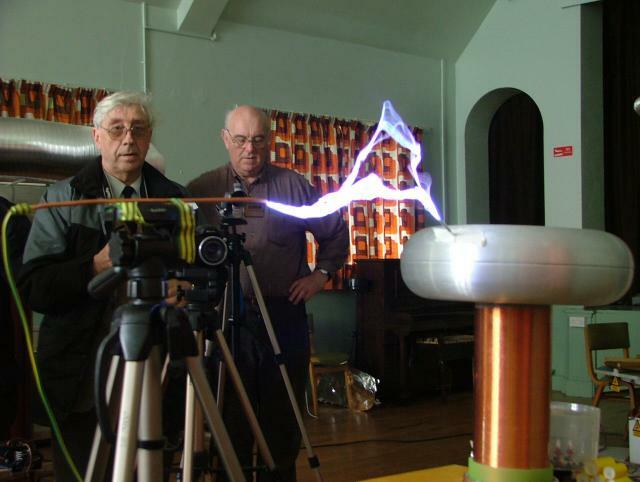 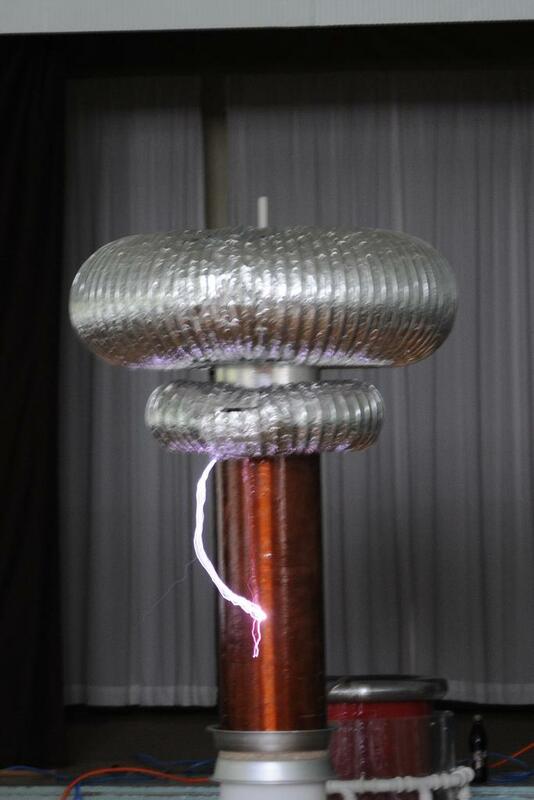 Martin Dales Tesla coil, a strike to its Strike Ring. 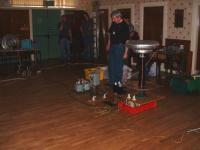 Various Bits and peices from Mike Harrison.